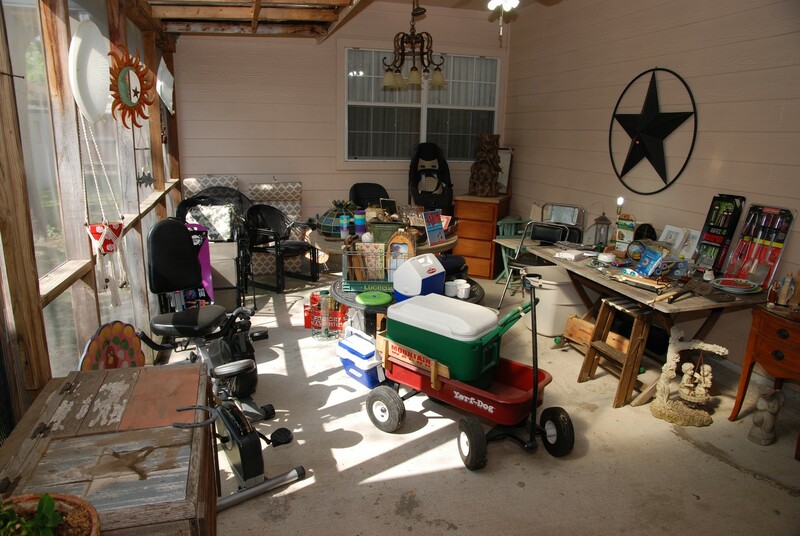 This week we have a very interesting Estate Sale in Farmer Branch. 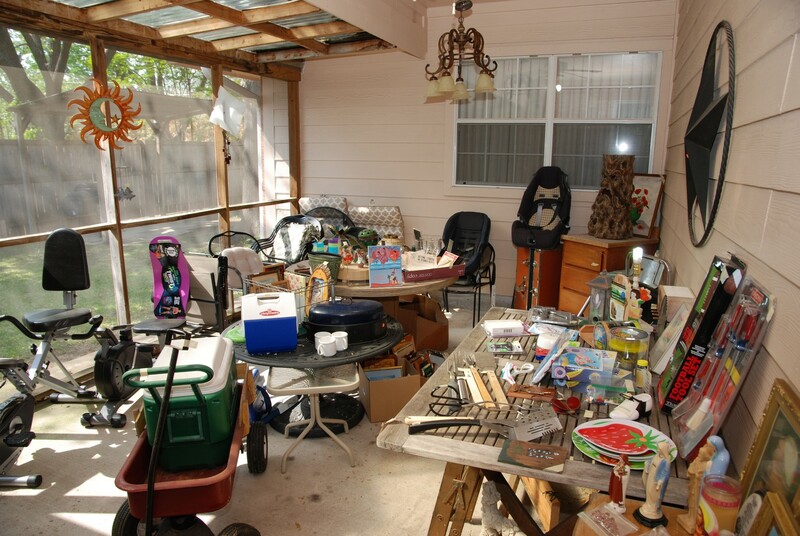 This house is packed with assorted traditional and vintage items along with lots of patio and yard art all in very good to excellent condition. 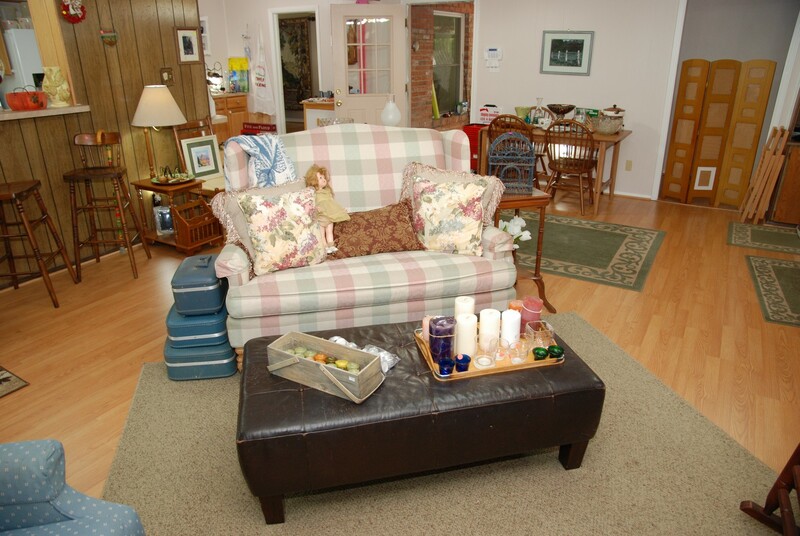 We have nice furniture, interesting décor and household items along with assorted small to medium size area rugs. 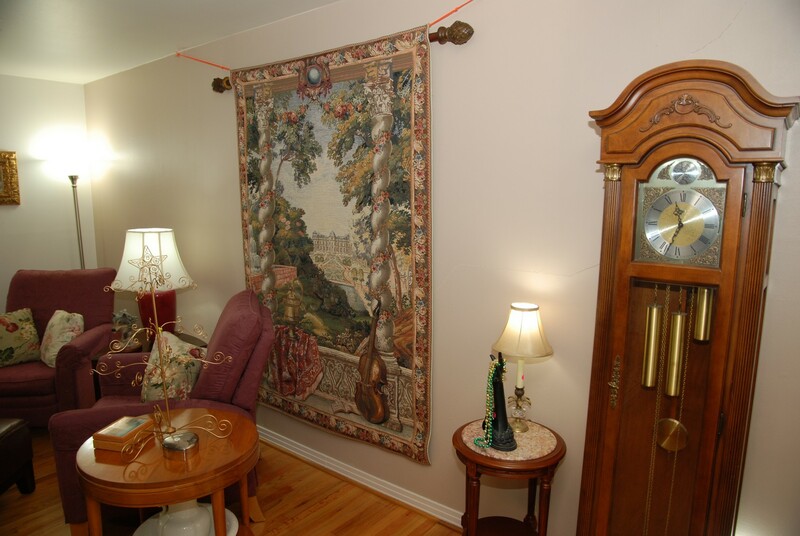 We have a very nice wall tapestry and some nice Lenox china and crystal goblets with gold rims. There is also a nice assortment of jewelry including some sterling and pearl items. Come early for the best selection as we will increase our discounts throughout each day of the sale. We must limit the number of people in the house and will distribute sequential numbers to those waiting to enter when we open each day. Thank you for your patience! 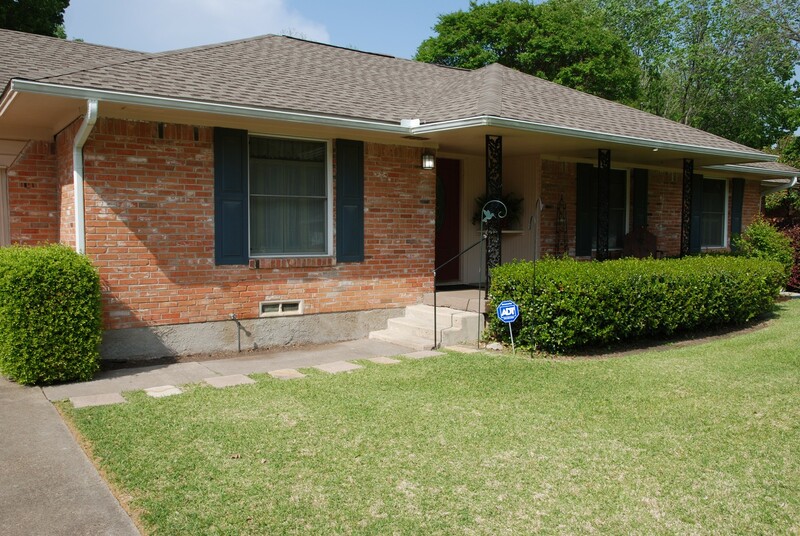 If you have questions, please text them to Donna at (972) 679-3100. That’s the best way to reach her. Entry / Living Room / Checkout Area – features a very nice large wall tapestry: “Chateau Lyons” from Belgium by Flemisch Tapestries. Made of 70% cotton and 30% viscose and comes with rod and hangers. 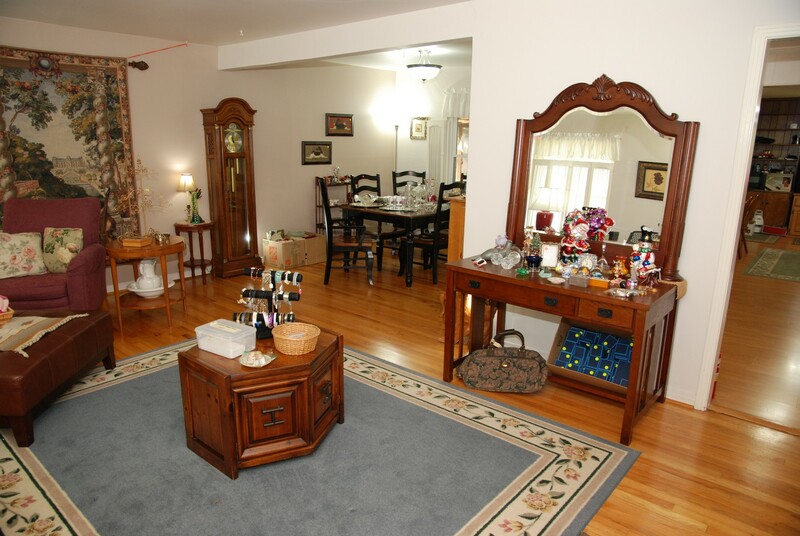 We have a large beveled mirror with a very nice wood artistic frame. 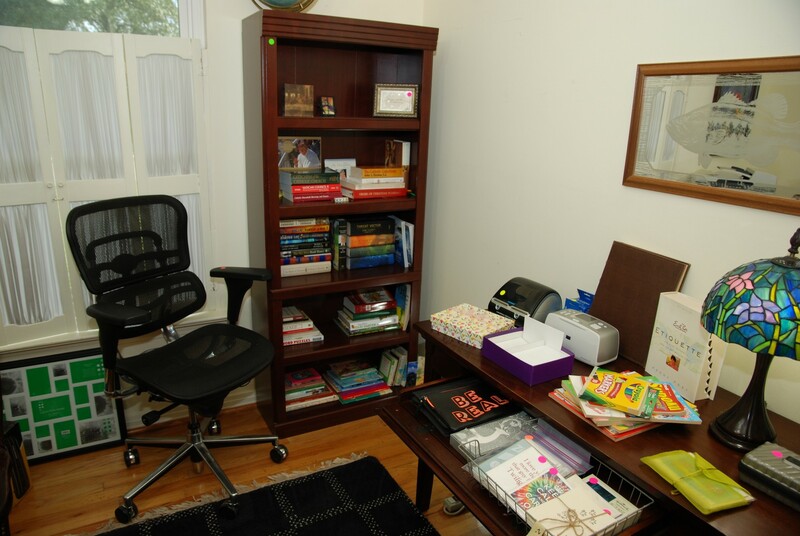 There is a nice open bottom Shaker style desk with computer drawer and a small single drawer. 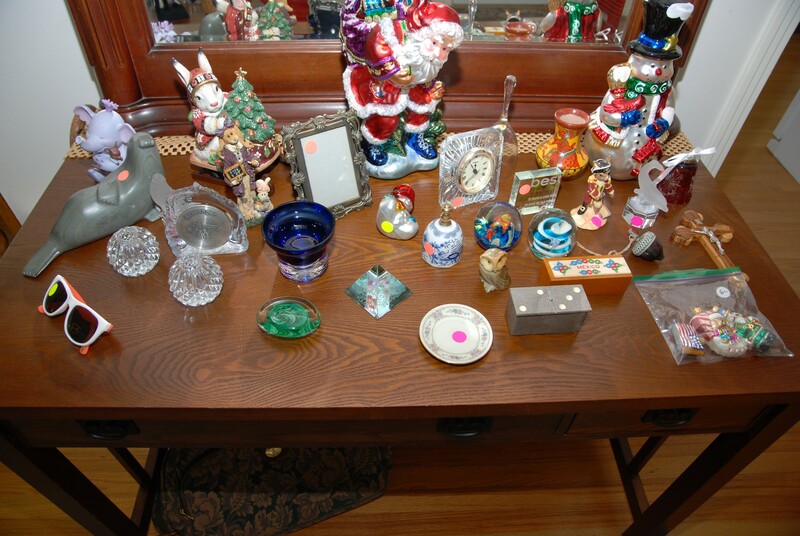 We have some very nice collectables of glass, wood and large collectable Christmas ornaments, a Santa, & Snowman along with Waterford candle holders. We have a nice signed Canadian Native Eskimo art Sea Lion (Esquimou) carved in stone. We have a nice assortment of blue jewelry boxes and travel bag along with a ladies soft sided pair of leather honey brown boots in size 9 ½. 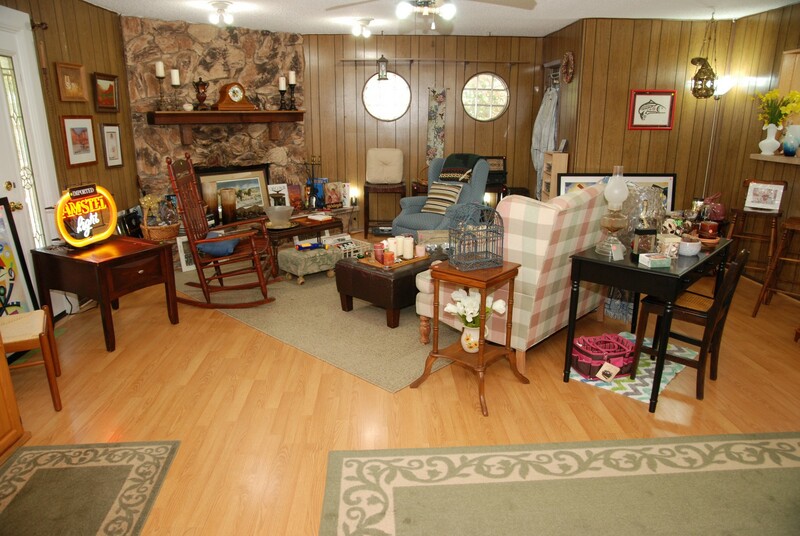 There is a nice area rug in blue with a boarder design, and an unusual hexagonal side / end table with storage. We have some nice jewelry in cases like rings, sterling bracelets, earrings, costume pins, coral and turquoise pieces and more. We have a necklace display with nice costume jewelry and two more cases of sterling and fresh water pearl jewelry. Please ask for help with the cases. Thank you. 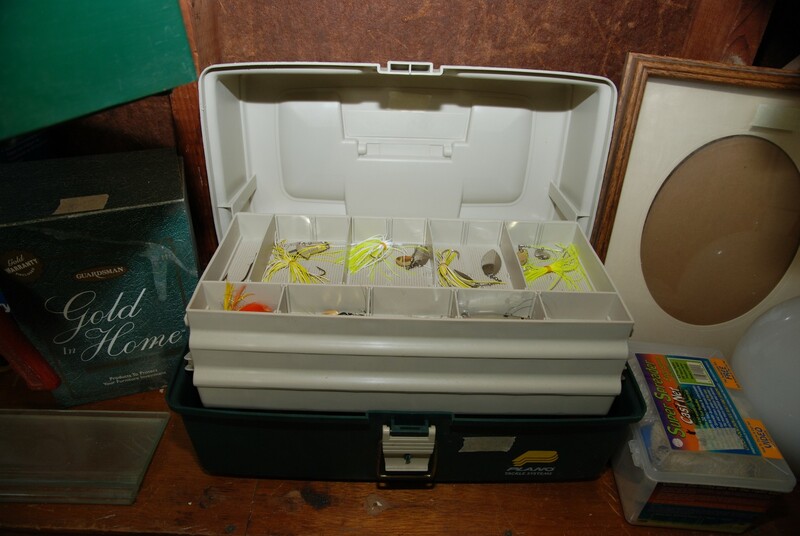 We have a rocket bank from the 1970’s and some universal programmable remotes along with some fishing knives. We have two very nice and unusual triangle shaped side tables with bottom shelf. We have a collectable “One Giant Leap” Dallas Morning News insert. There are two matching lamps with nice shades (BNI). There is a matched pair of push back recliners and nice large leather-like ottoman. 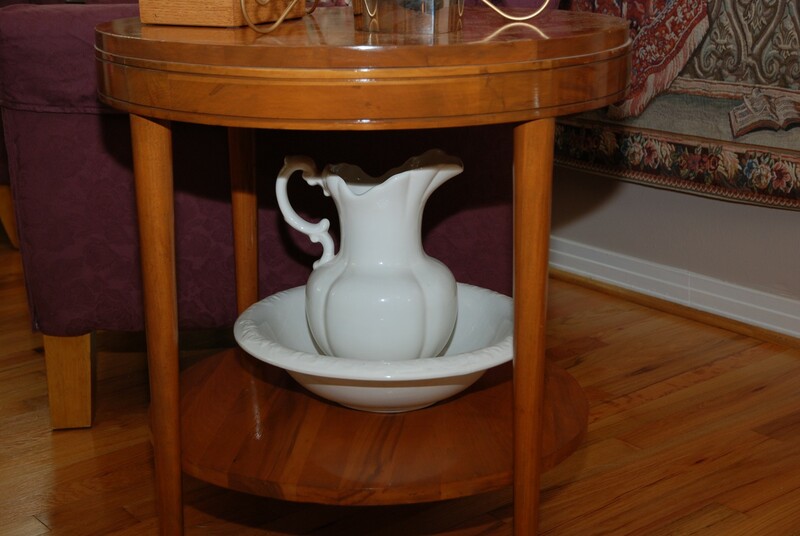 There are also two nice round side tables; one is a modern design in a honey color with lower shelf, and the other is a smaller round with a marble top and lower shelf. We have a three-weight Grandfather Clock that needs to be serviced. It has the moon and sun dial. 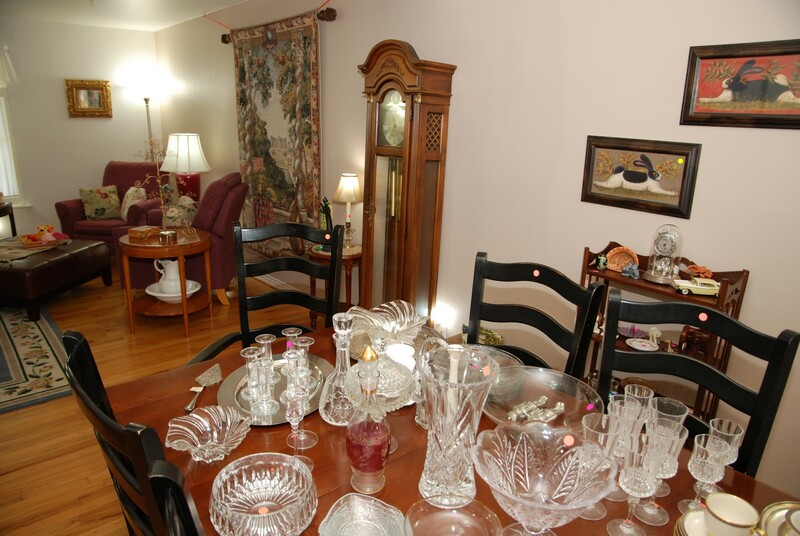 Dining Room – features an awesome set of Lenox China from the Presidential Collection; Hamilton. It’s a nice four piece place setting for eight with additional serving pieces. 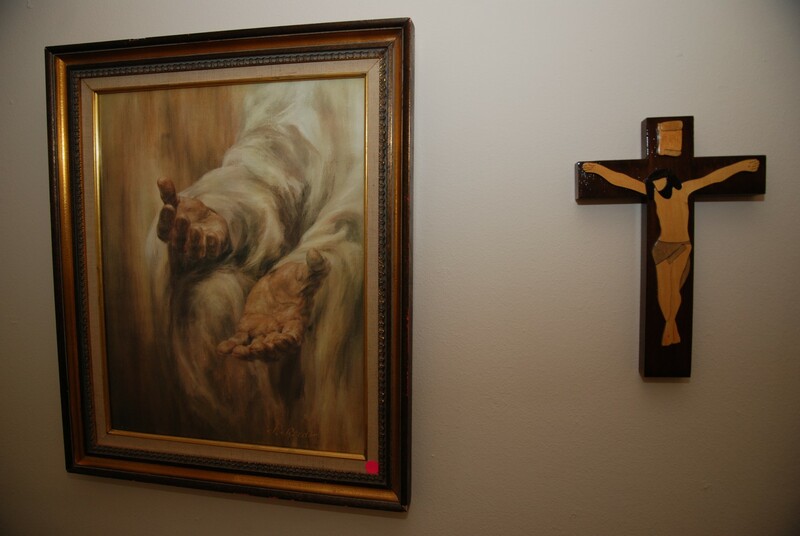 We have two framed rabbit pictures and two framed Asian pictures. 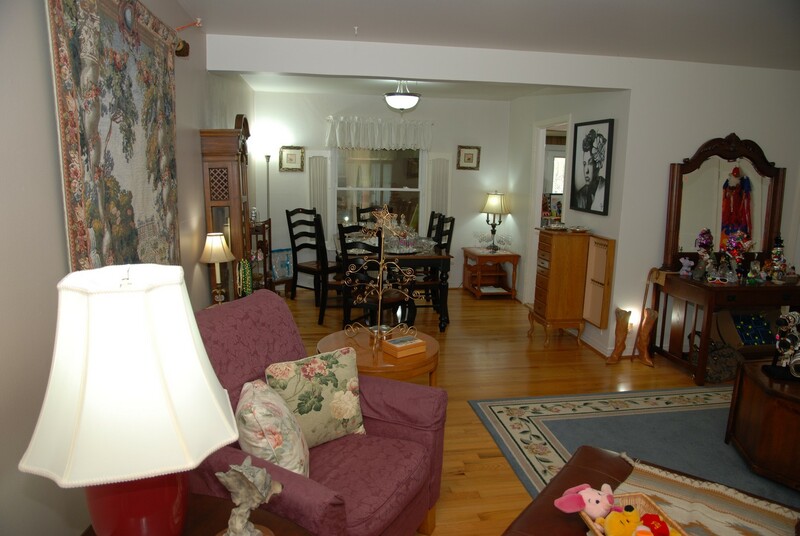 The dining table is rectangle with one leaf and has six ladder-back style chairs; two have arms. 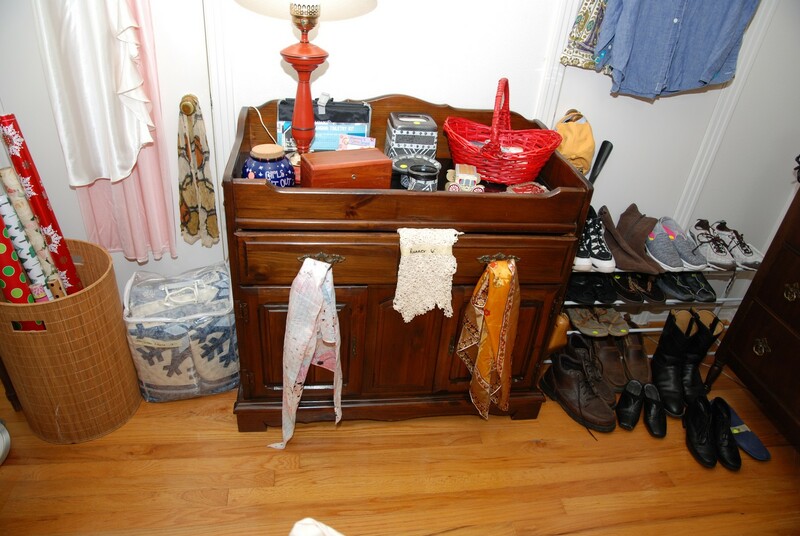 We have a nice vintage ornate book shelf / display and a nice solid oak jewelry chest. 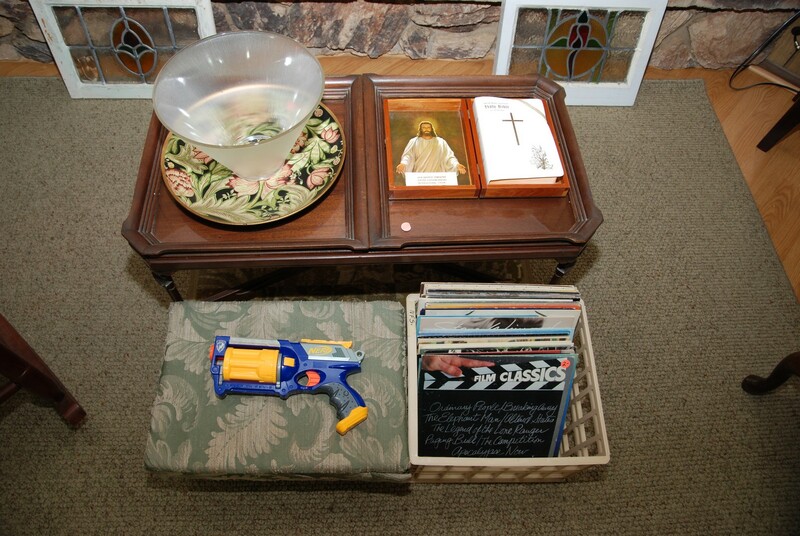 We also have a nice side table with cut glass top that has a magazine rack and shelf combo on the bottom. 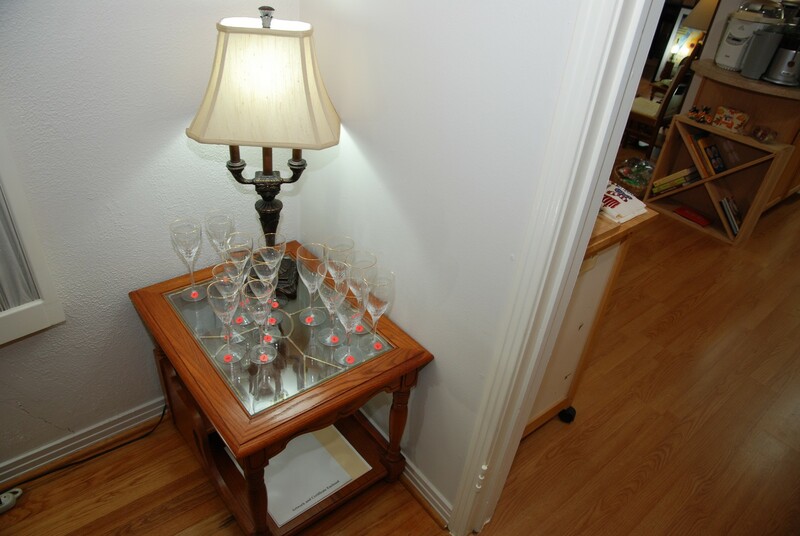 We also have two different sets of crystal glasses/goblets, a Crystal vase, and bowls. 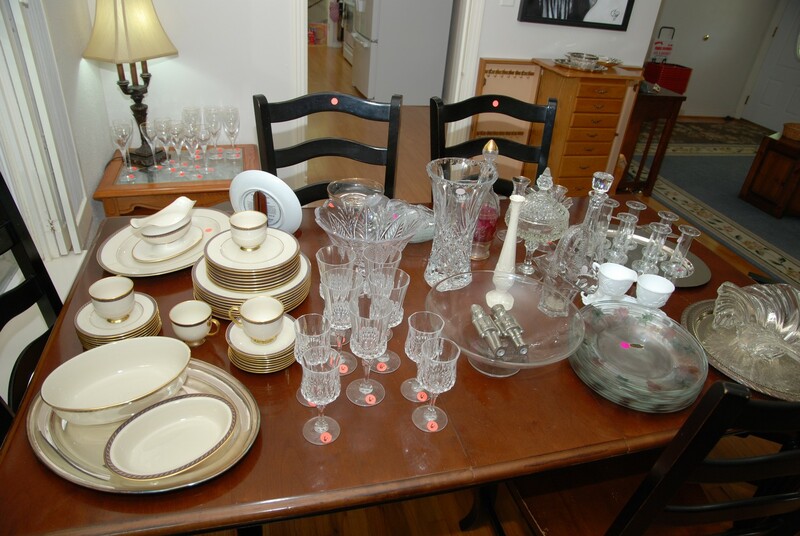 We have candle sticks, silver plate trays and milk glass cream & sugar with tray. 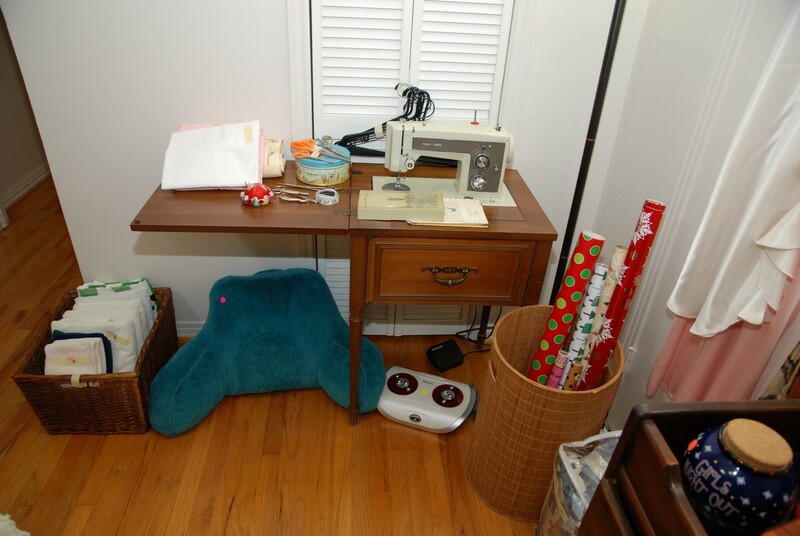 We have linens and a cute wood footstool. We have new candles with assorted scents along with many other collectables. 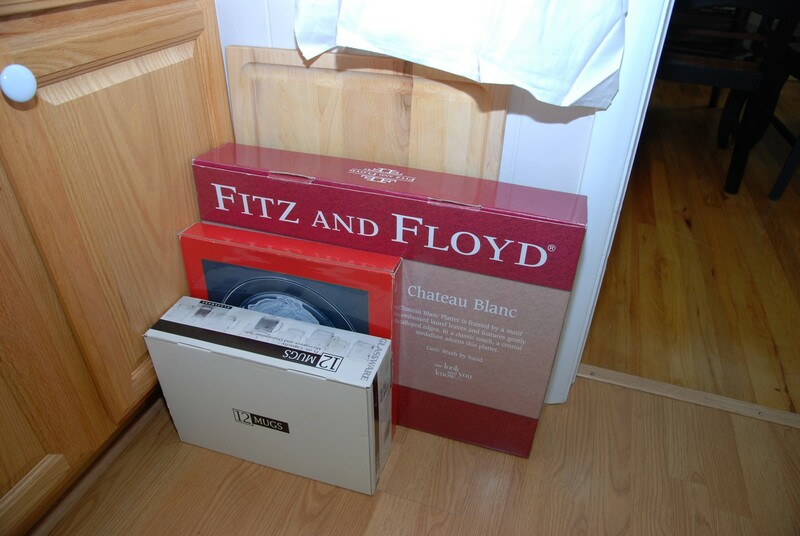 We also have some nice serving plates and crystal wine, liquor crystal decanters along with crystal cordials. We also have some are prints. 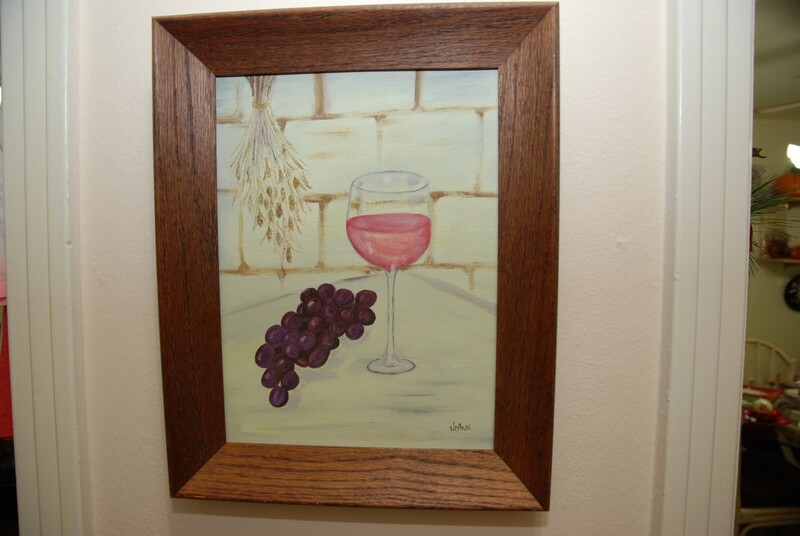 One is a nice 1998 artwork; serigraph print “Debbie” by Linda Le Kinff Park West. 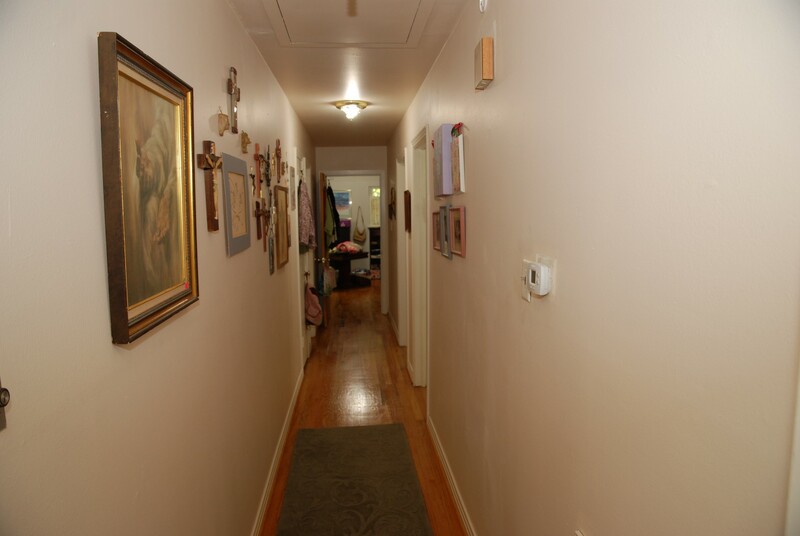 In the corner is an interesting decorative double post lamp with shade (BNI). 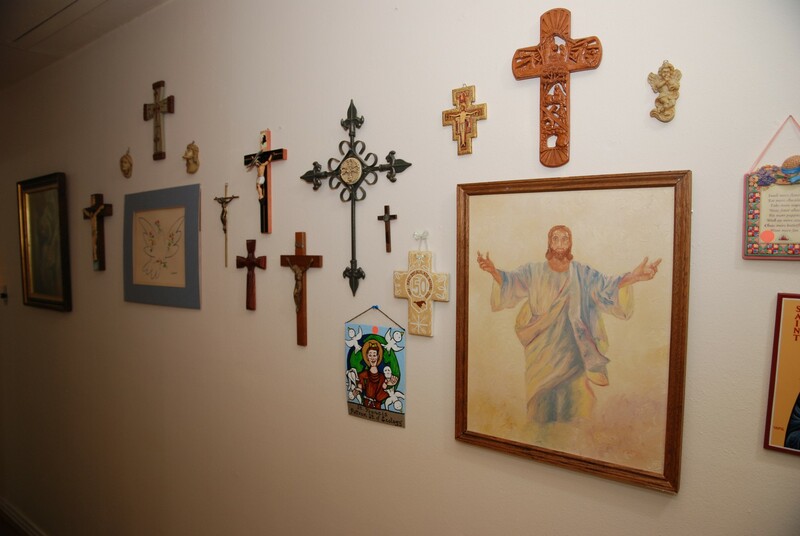 Bedroom Hallway features lots of religious pictures, crosses and crucifixes along with other art. 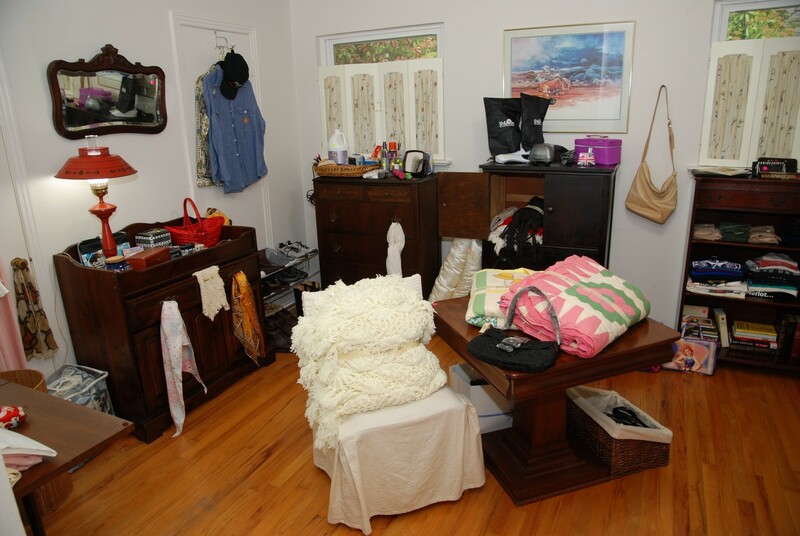 Front Bedroom – features a nice rattan base table with a round glass top. This table has four matching chairs with cushion seats. It also has one matching round stool. 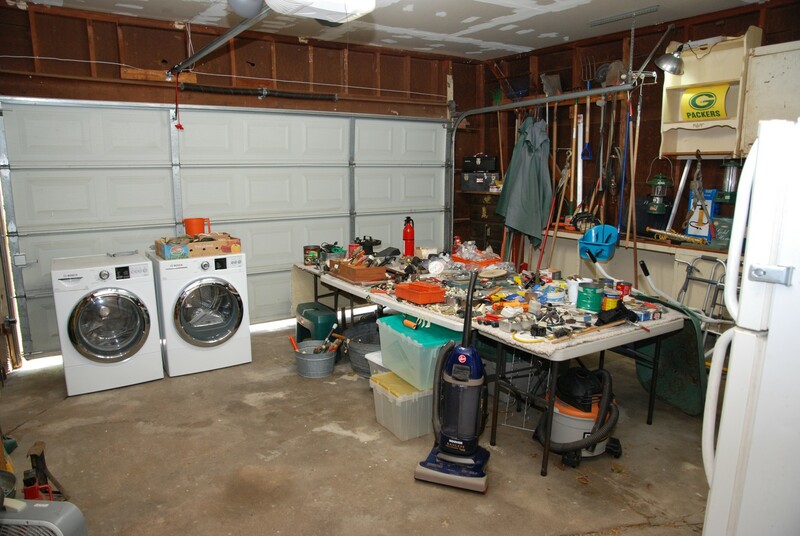 There is a nice tall five-shelve two-door storage unit. There is also a matching five-shelf open book case. 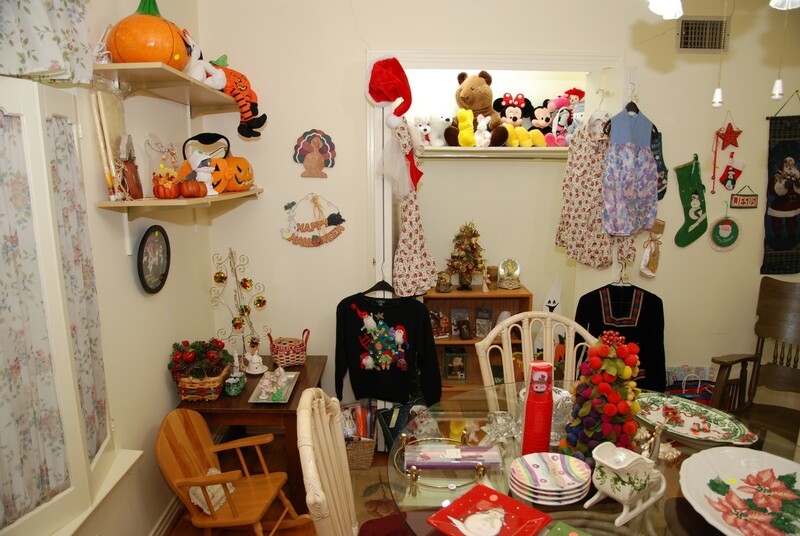 Inside the closet is a matching short bookcase. They’re priced separately. This room has a nice floral design area rug. 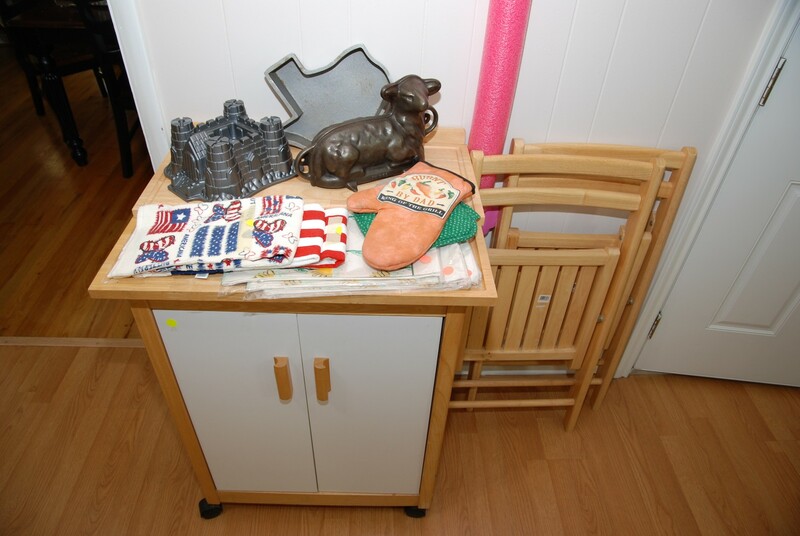 We also have a child’s rocking chair and some toys like Lincoln logs (no box) and large set of Lego blocks along with an adult wooden rocking chair (very comfortable). 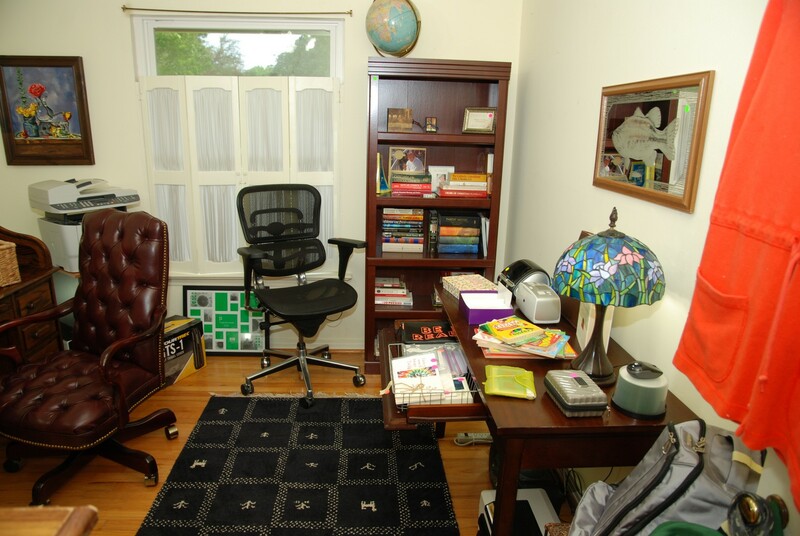 We have a cork board and a small table lamp with shade (BNI). 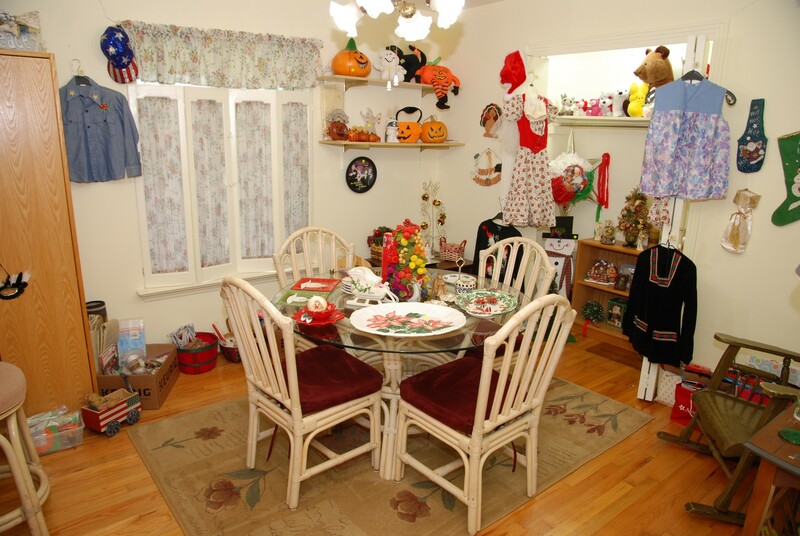 This room features Christmas, Halloween, Easter and 4th of July decorations and a nice assortment of stuffed animals. Come early for the best selection. 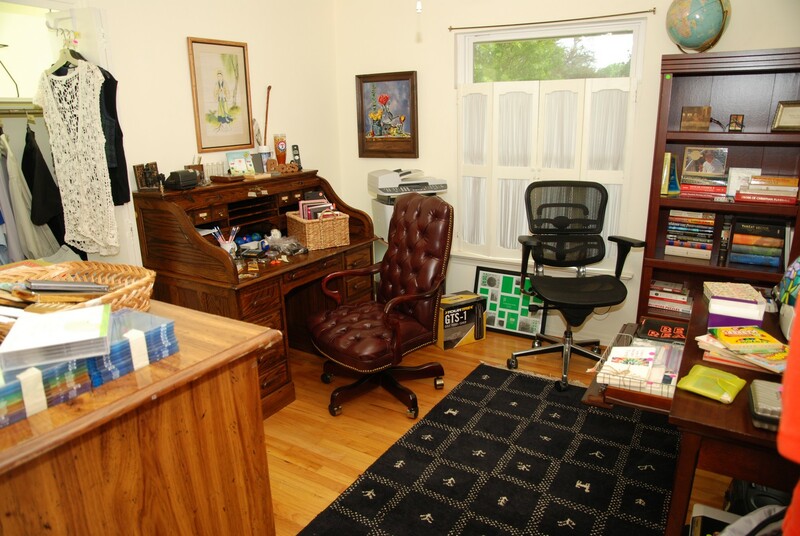 Office – features a great roll top desk, and a nice wood bookcase. 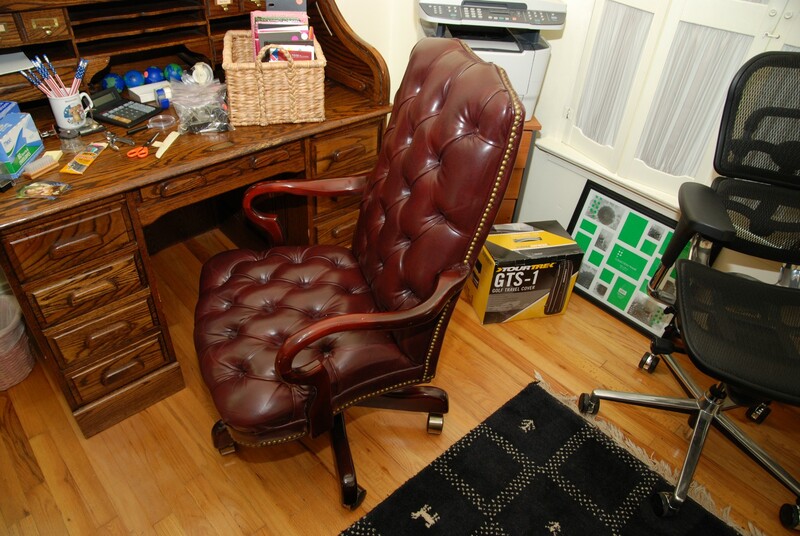 We have a leather high-back executive office chair and a modern computer chair. There is a tiffany style lamp on another computer drawer desk. 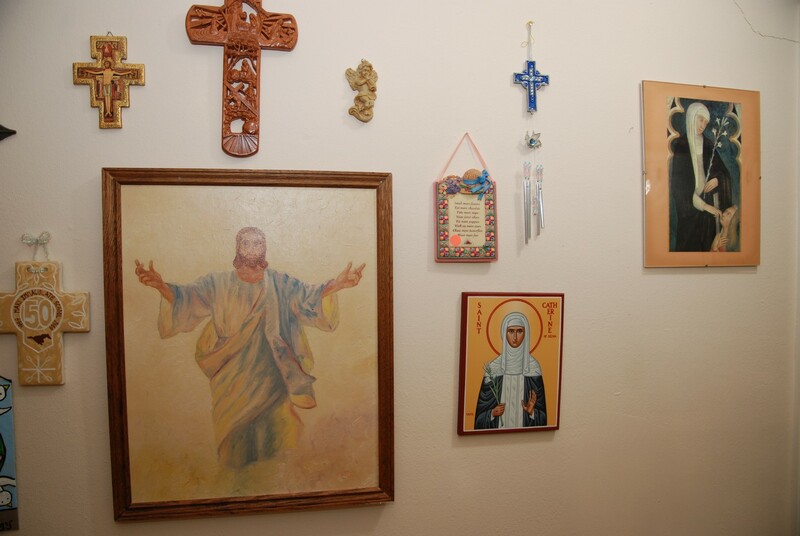 We have a nice assortment of books including some Catholic. 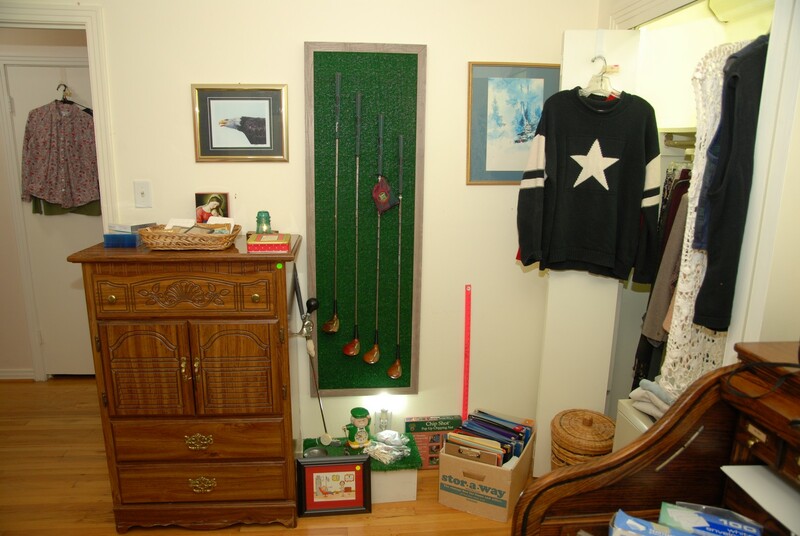 This room also has a smaller area rug. 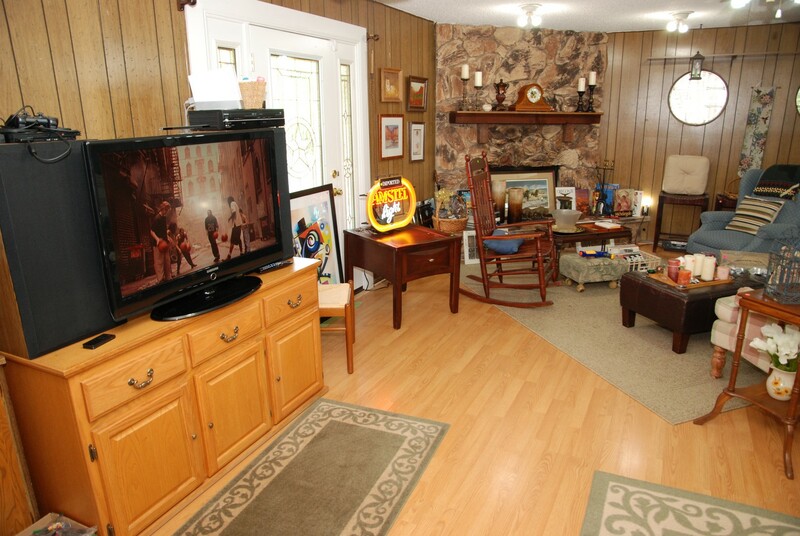 We have an interesting fish mirror, a world globe and other framed pictures. 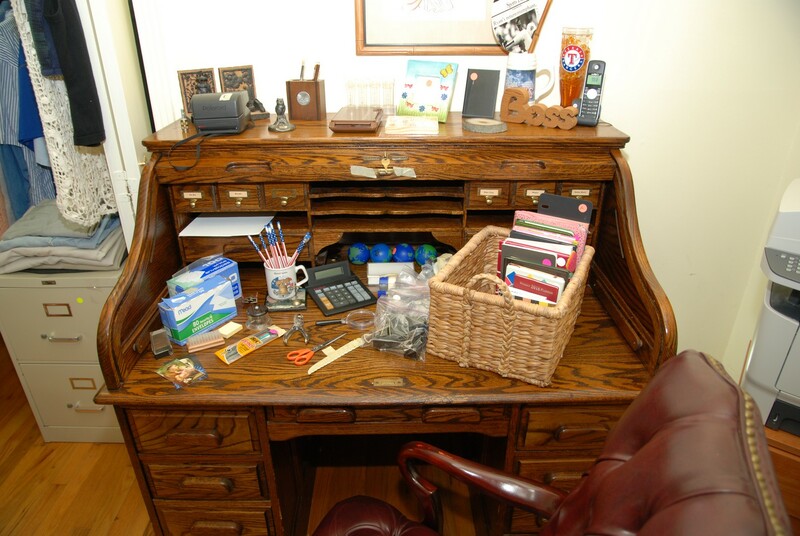 There are some interesting office items as well as a nice two-drawer legal file cabinet. 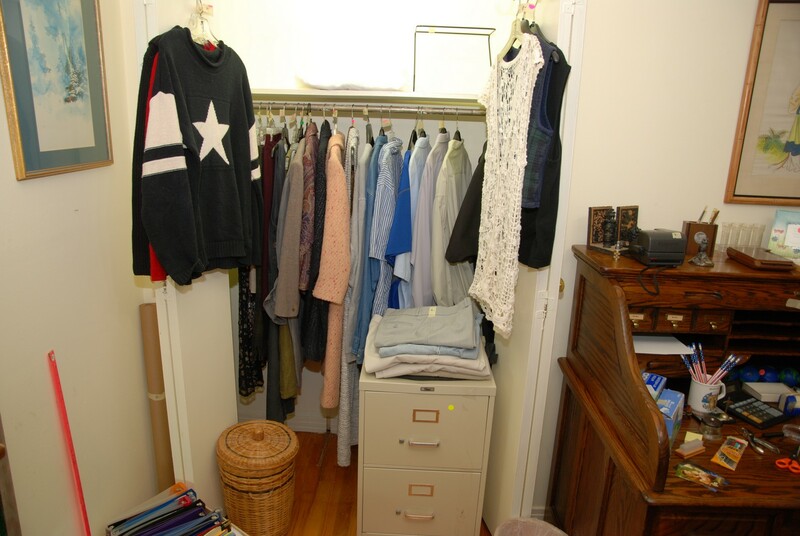 There is some men’s and women’s clothing in the closets and on the doors. We also have a nice smaller chest of drawers. 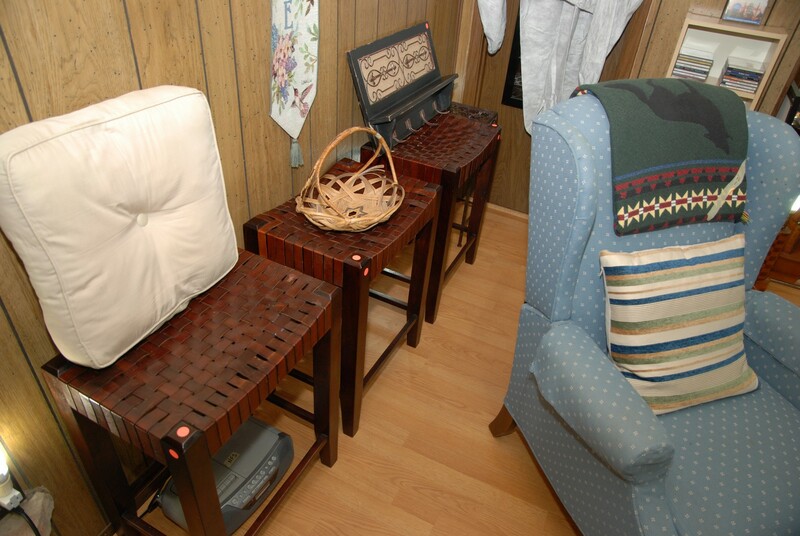 There is a small rattan and metal-base side table with drawer. 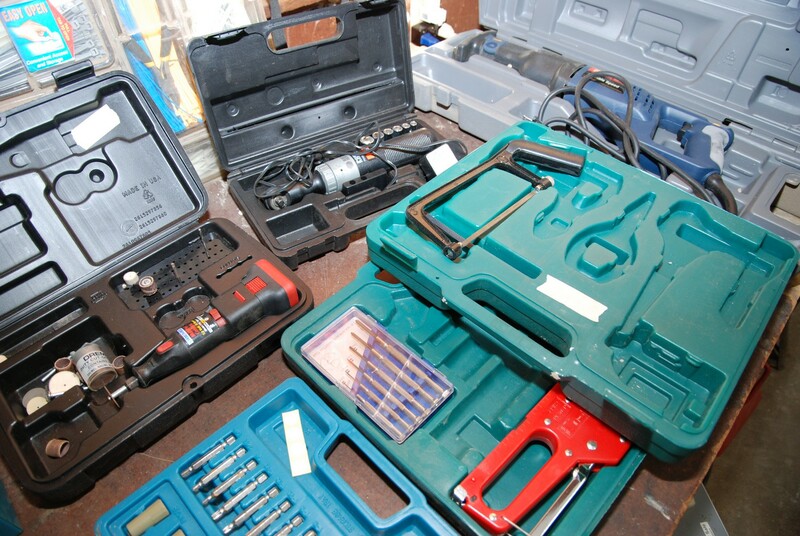 We have a fireproof lockbox (key at desk) and a nice assortment of back-packs. 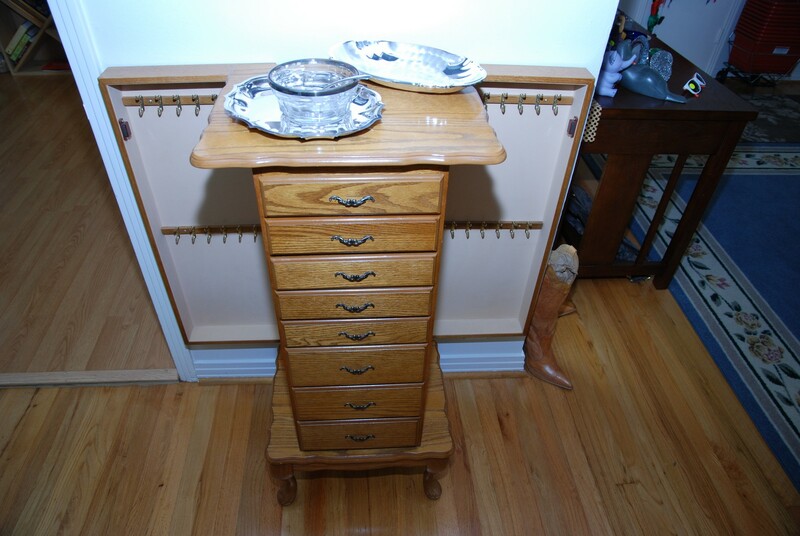 There also is a three-drawer simulated wood cabinet; the bottom drawer is a file drawer. 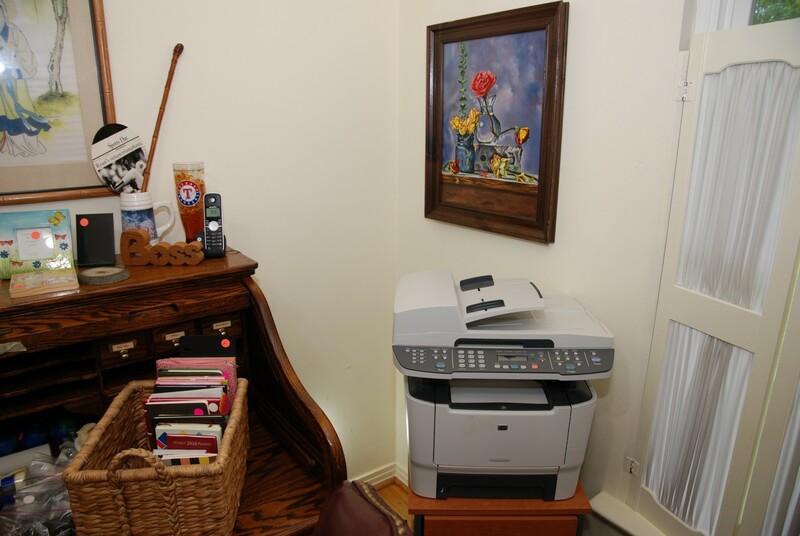 We have a HP Laser Jet M2727nf printer and two new HP LaserJet 53A ink cartridges (sold separately). 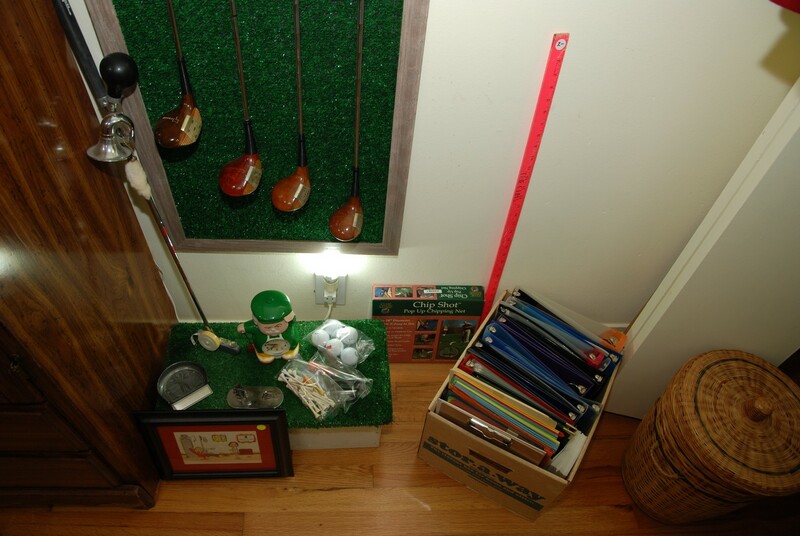 There is a set of woods (St. Andrews course) as decoration along with other Golf Items including a travel cover. We have a box of office supplies and note cards. Come early for the best selection. 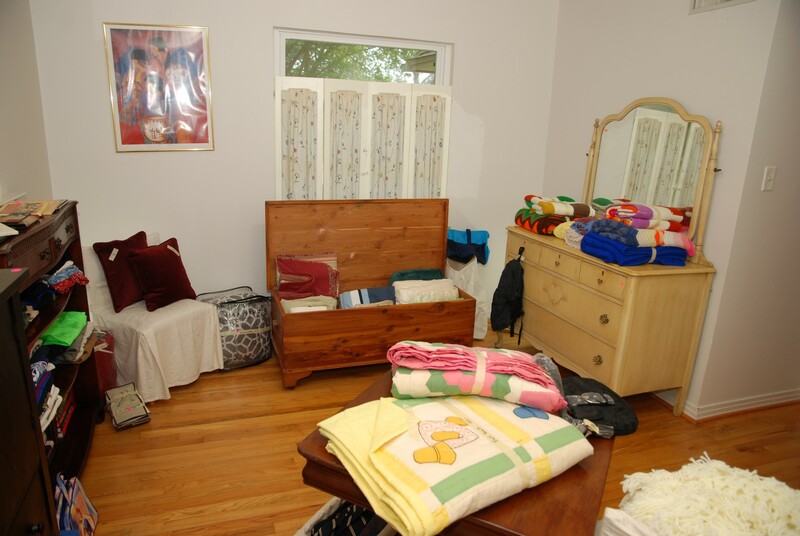 Master Bedroom – features some interesting furniture. 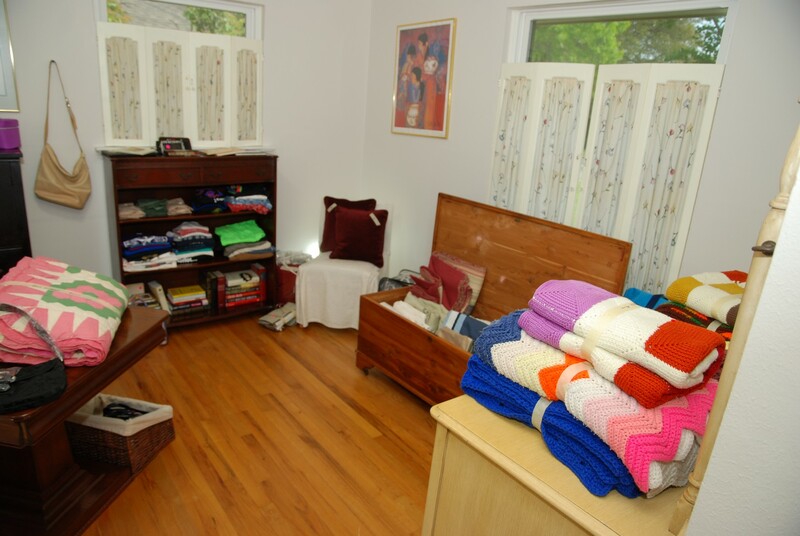 We have bedding; sheet sets, pillows, multiple handmade throws from lap and shoulder blankets to full throws. We have two handmade quilts. One is very intricate, and they are in excellent condition. Come early for these beauties. We have a nice square vintage solid oak table. It has a large square base and is an awesome find. There is a vintage dark wood chest of drawers in nice condition along with an awesome vintage bookcase (Duncan Phyfe era) in excellent condition. There is another vintage solid wood chest of drawers. We also have two matching armless bedroom chairs. 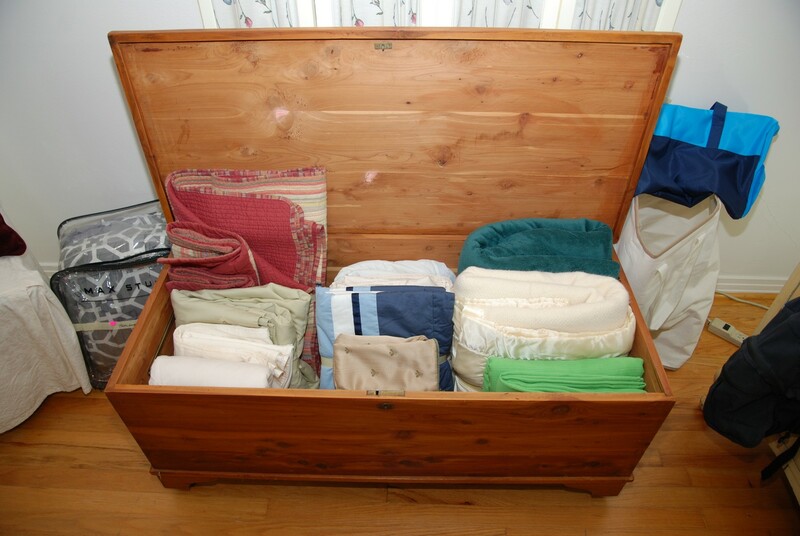 We have a nice cedar chest that can be used for fabric storage or as a toy chest. 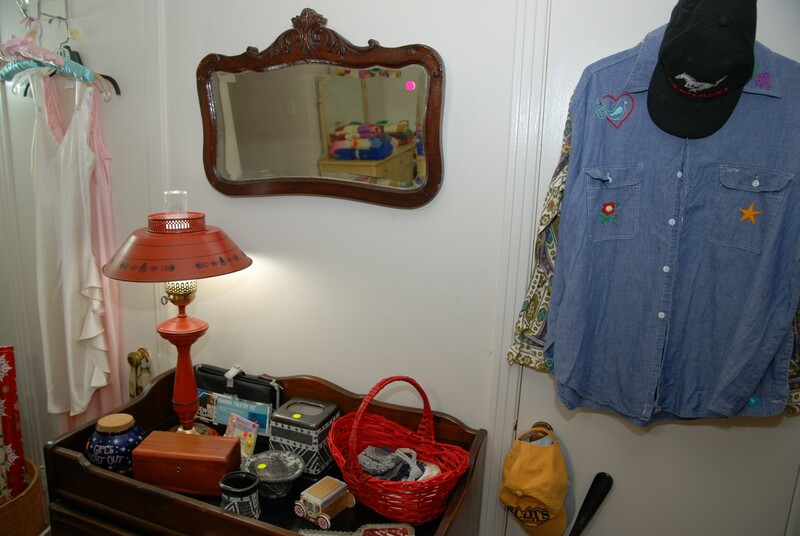 There is also a light colored wooden double dresser with matching mirror. We have some towels and a Singer Sewing Machine Model 1410 Zig Zag in a nice cabinet along with instruction book and attachments. 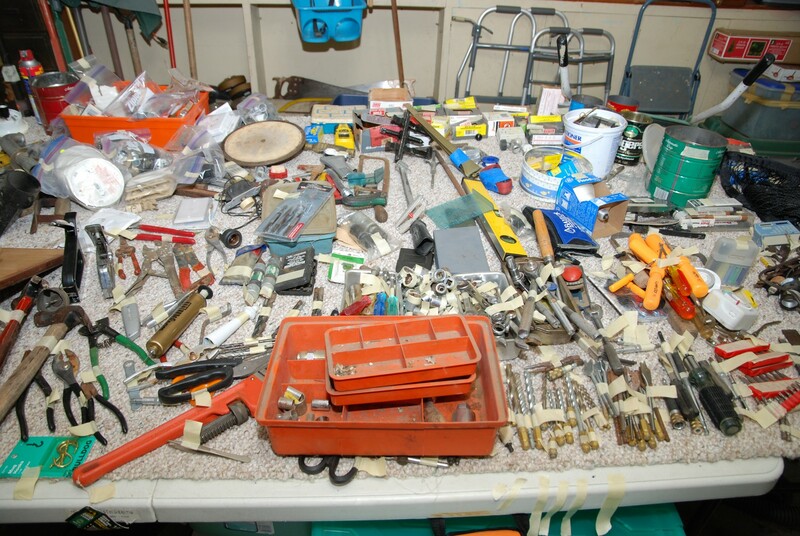 We also have assorted sewing notions. We have another vintage wood changing table / chest of drawers. 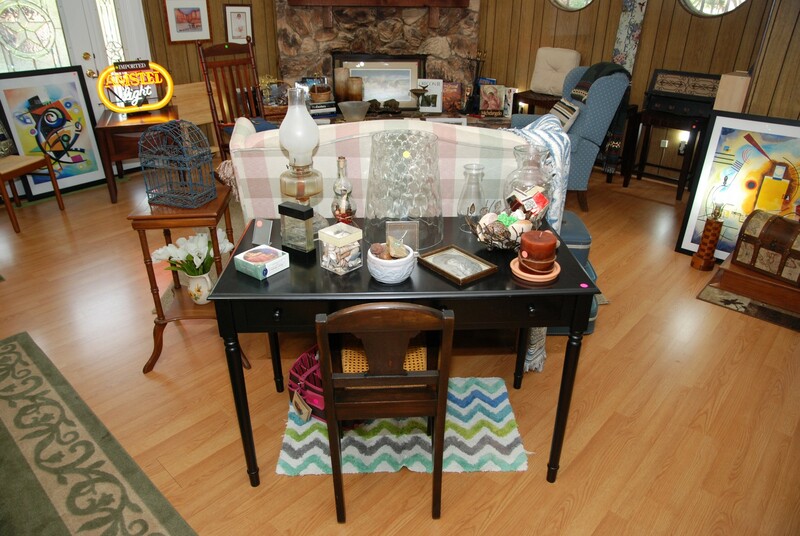 We have a vintage orange metal shade and base hurricane style lamp (BNI). 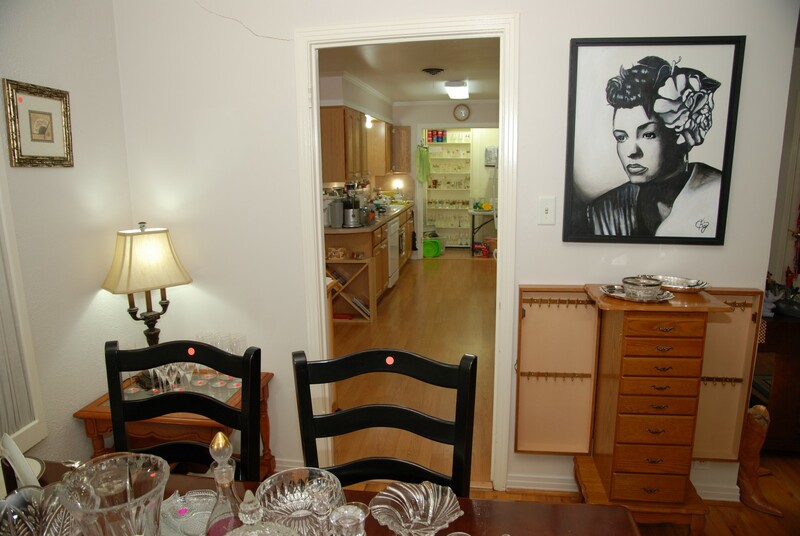 There is a vintage framed beveled glass mirror. We have shoes for men and women on a shoe rack. 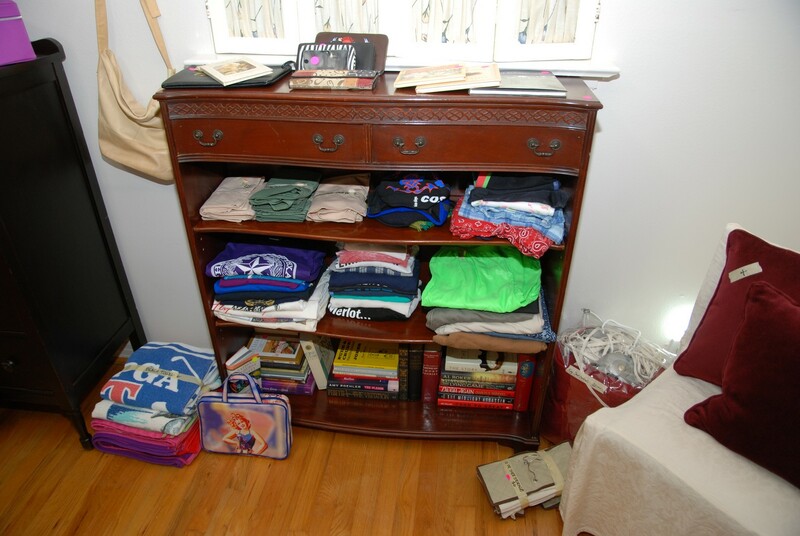 We also have some make-up, work out clothing, and a basket of men’s ties. Again; come early for the best selection. 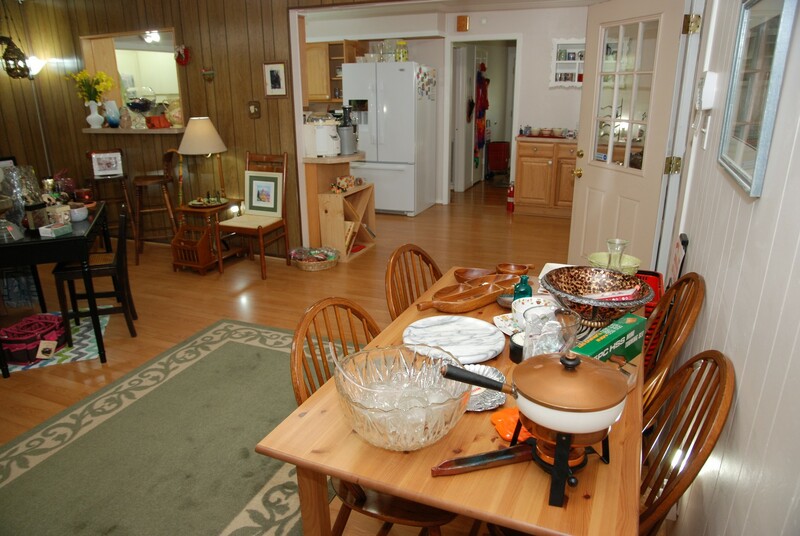 Kitchen & Eating Area – features an “X” shaped wine rack and a metal wine rack. 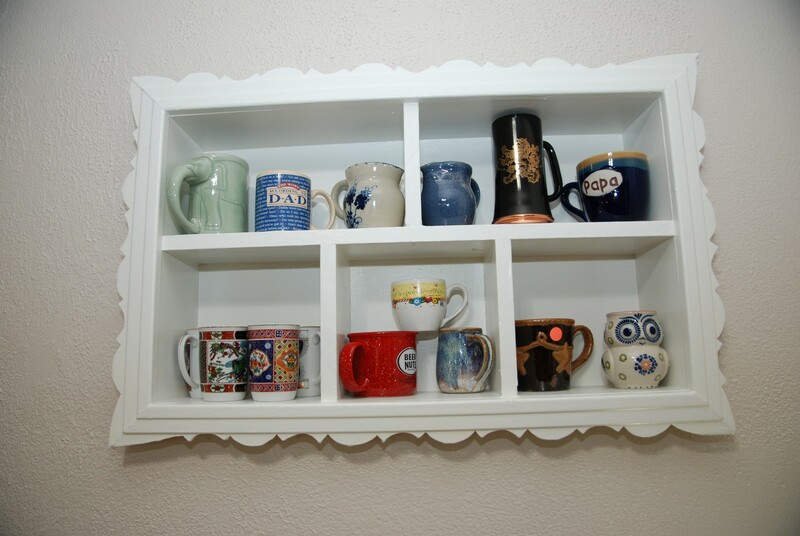 We have a nice collection of unique cups some new items still in their original boxes. 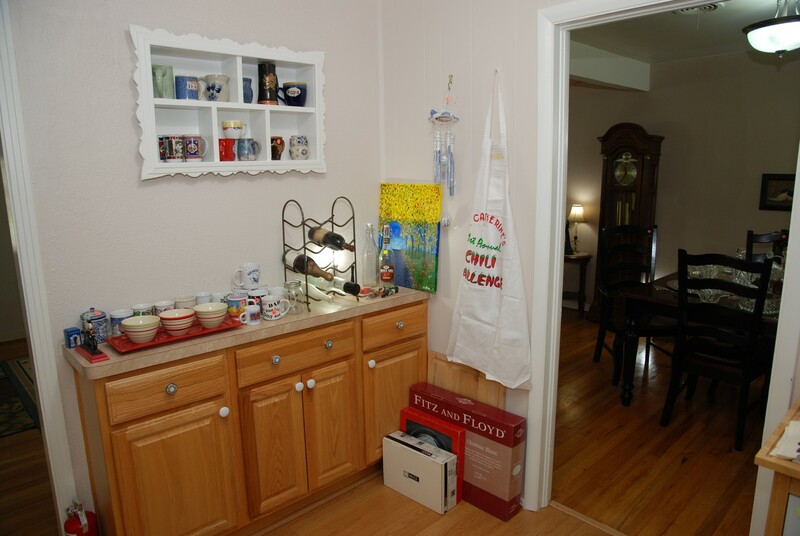 We have a nice painting, wind chime and new cooking apron. 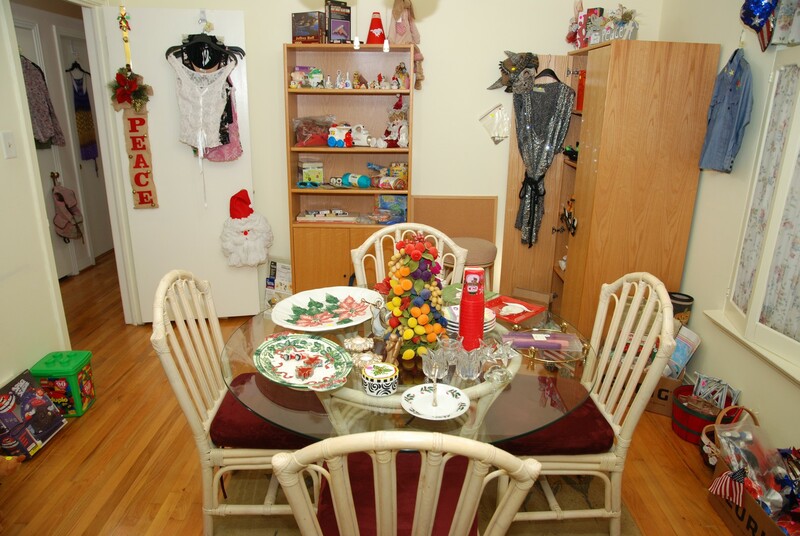 We have refrigerator door magnets, an assortment of cookie cutters, and a large area of small appliances. 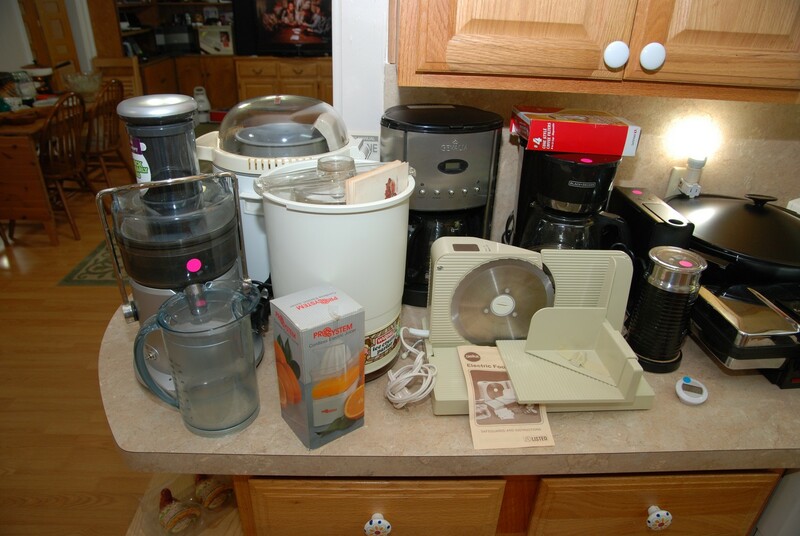 The Welbilt Bread Machine, the Breville Juicer, a Waring Ice Cream Parlor, a Gevalia Coffee Maker, a Black & Decker Coffee Maker, a Geka Electric Food Slicer, a Nespresso Coffee Maker, a Cucina Pro Waffle Maker, an Electric Wok, a Sunbeam Electric Water Pot, a Chefmate four slice Toaster, and a Black & Decker hand held six speed Mixer. 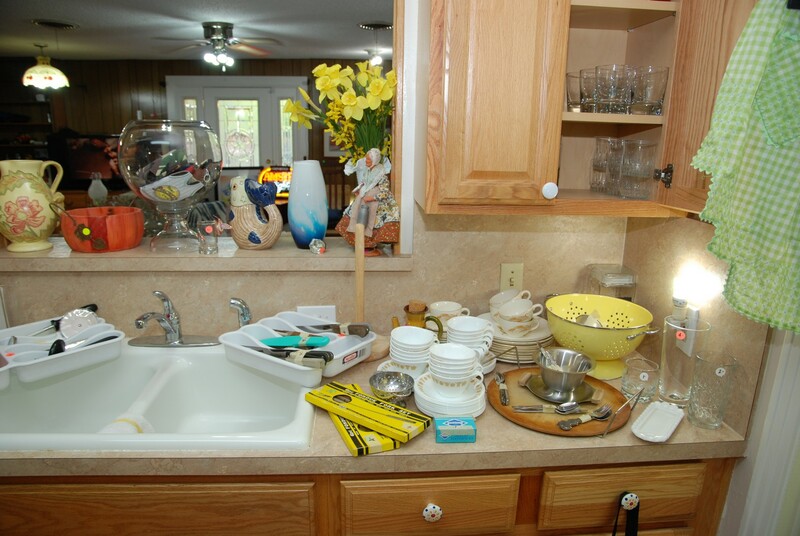 There are lots of utensils, gadgets, knife sets, a pizza stone with holder, cups and saucers, and a nice large yellow colander. We have an ironing board with cover and also a new cover. We have lots of cake decorating items along with lots of fun cake forms and pans including wedding cake forms. 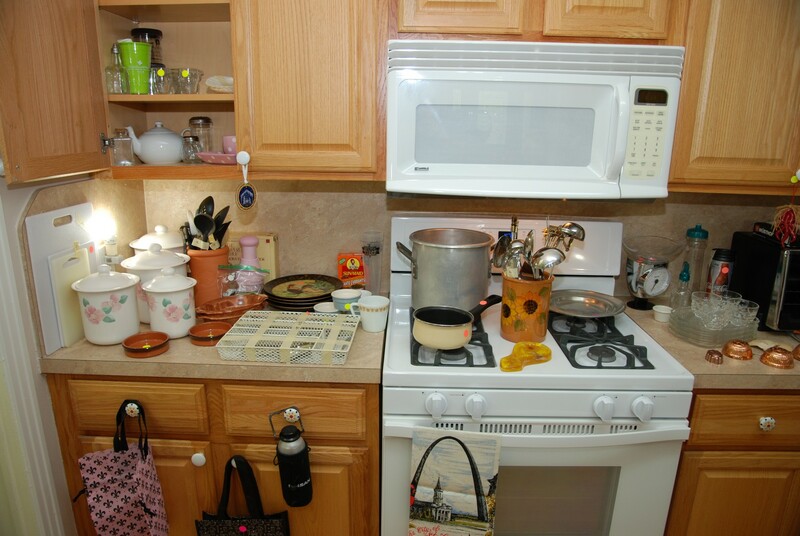 There is a nice stainless LG Microwave oven and lots of tins in different sizes. 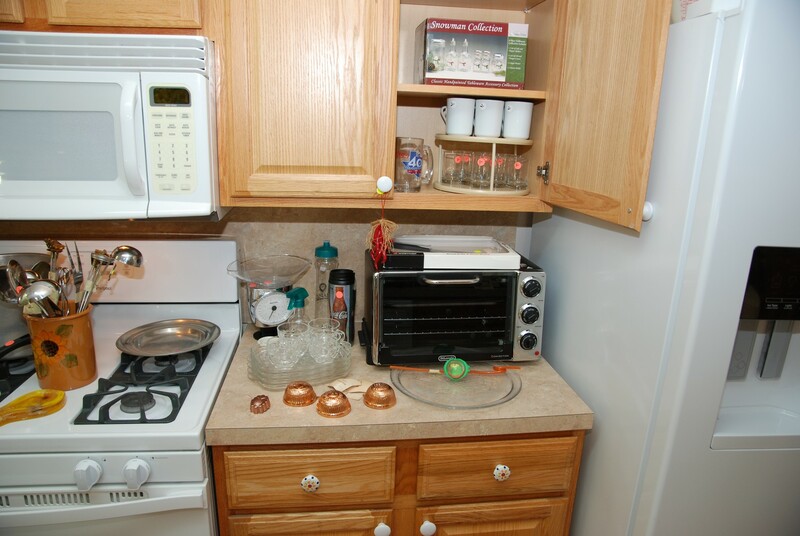 We have some cooling racks and pie pans. 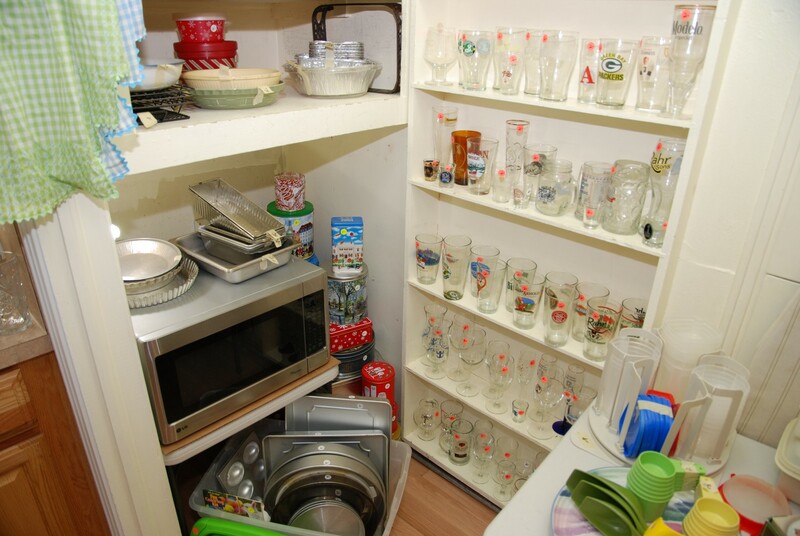 We have six shelves of Beer Glasses in different shapes and sizes – great to add to your collection. 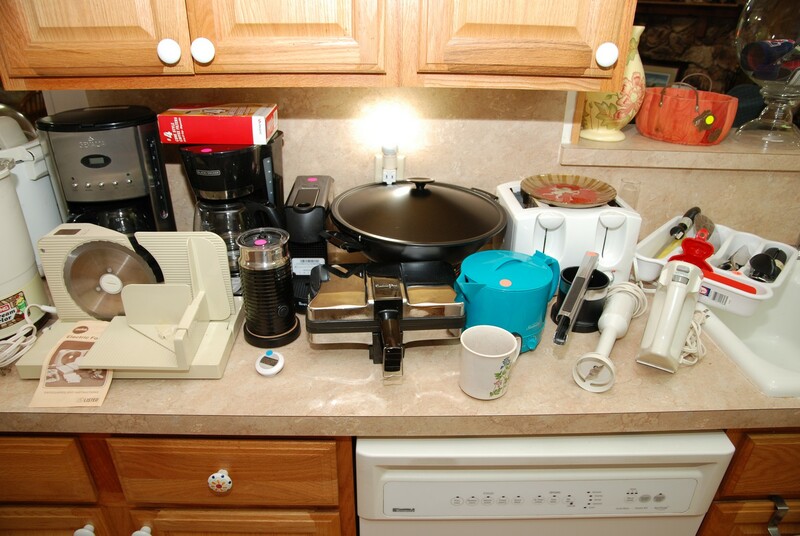 There is a set of canisters, set of flatware with holder, and a large Toaster Oven. 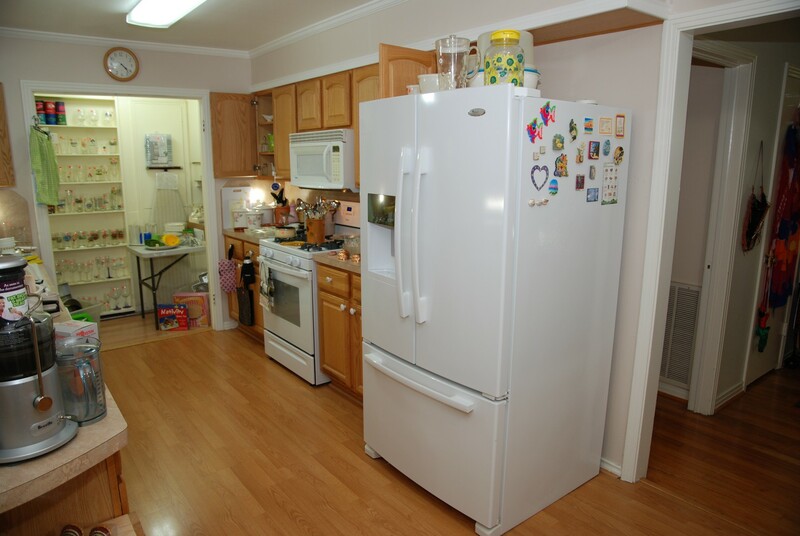 We have a large white Whirlpool Double Door Fridge with Freezer on Bottom. The freezer is the new more efficient style. 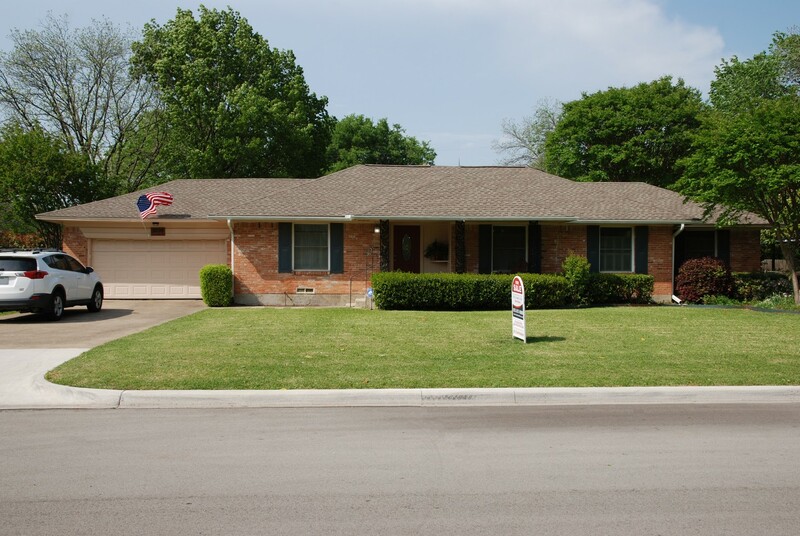 Come early as this one is like new and will not last long – a great find! We also have a portable rolling Butcher Block Cart with storage. 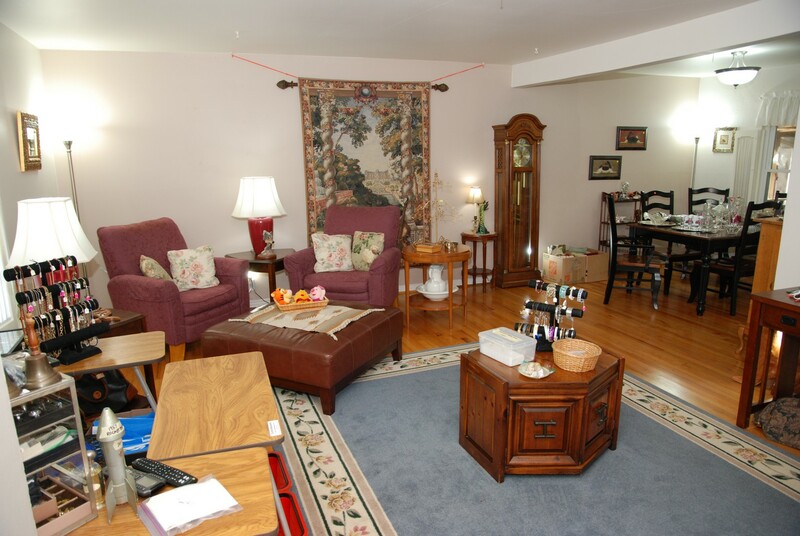 Family Room – features three area rugs; the two smaller ones are identical and match the medium size one. 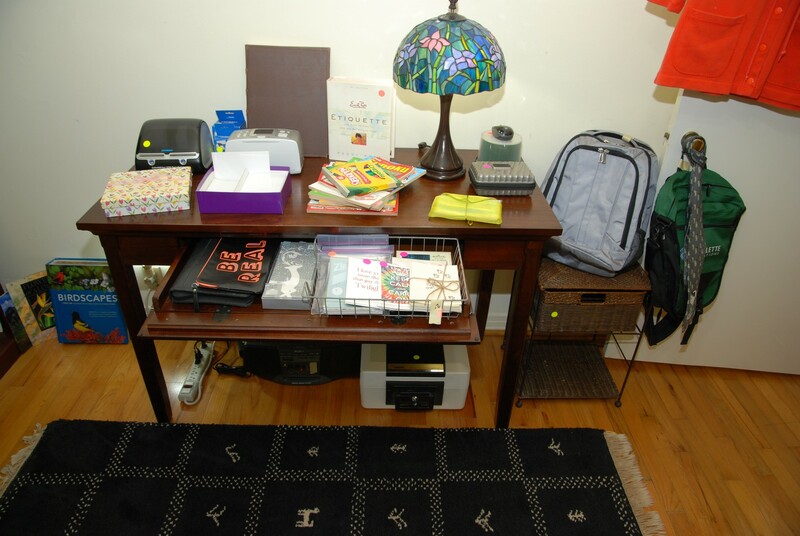 We have a rectangle table that has a solid top and a drop leaf on one side. We have four matching chairs with rounded backs. 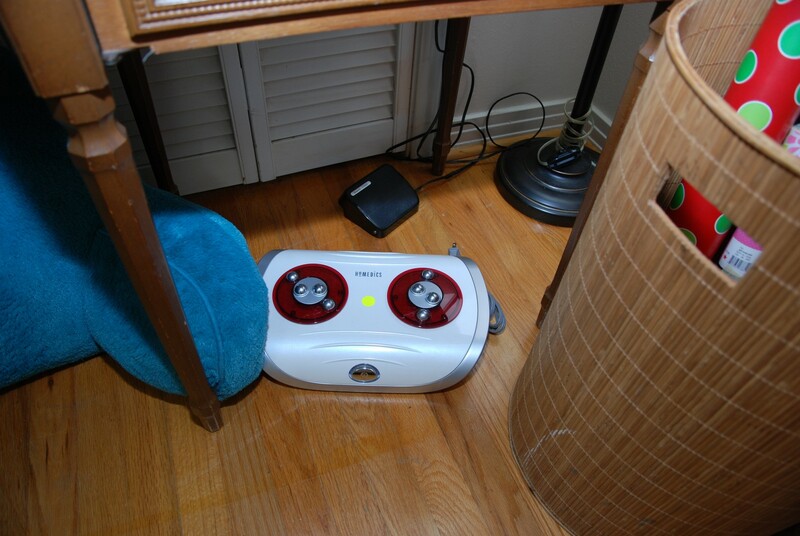 This table has an assortment of interesting items such as a chafing dish, monkey pod wood snack trays and small bowls. 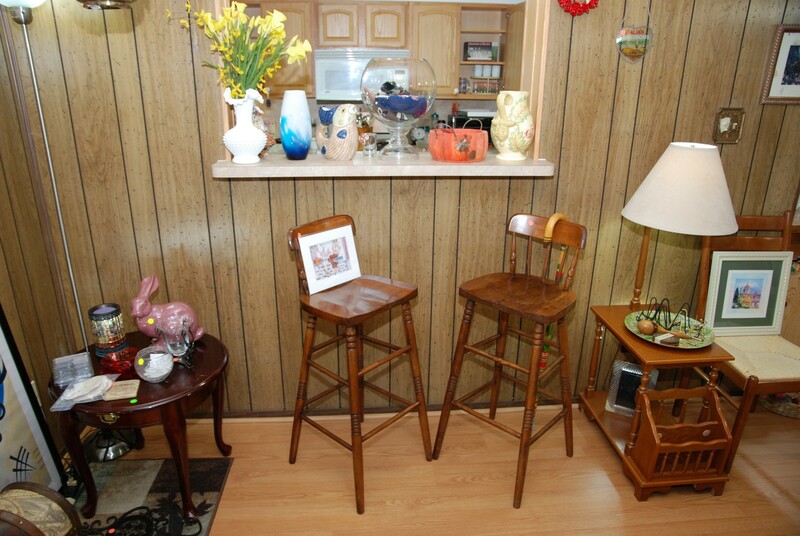 The bar area has two wooden bar stools with small backs. 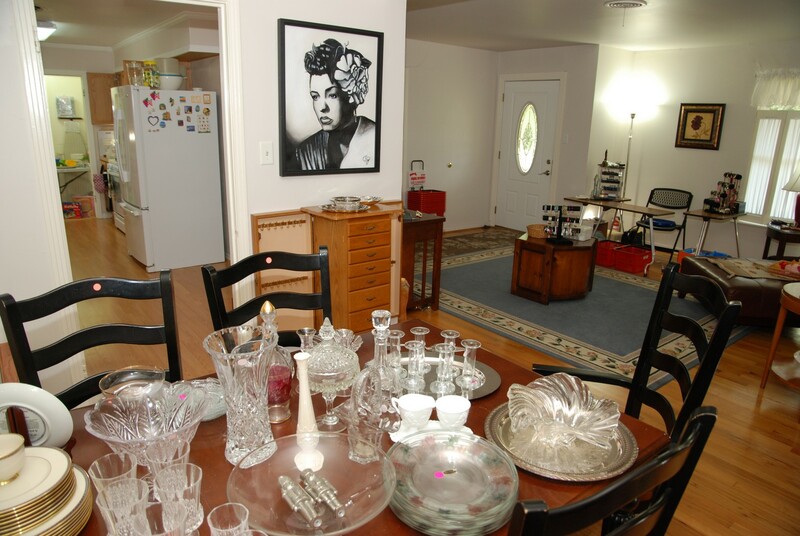 We have a nice round accent table with additional knick-knacks and some nice framed modern pictures. 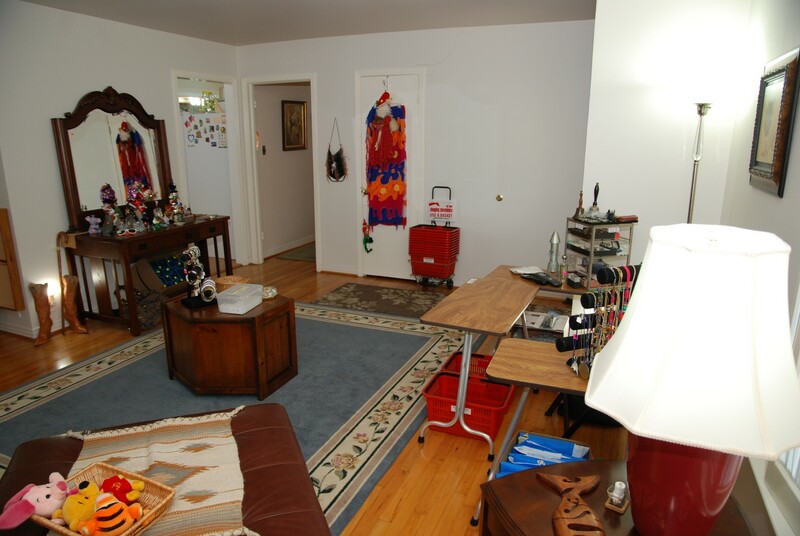 We have another small area rug and a side table lamp with shade (BNI) with magazine holder and bottom shelf. 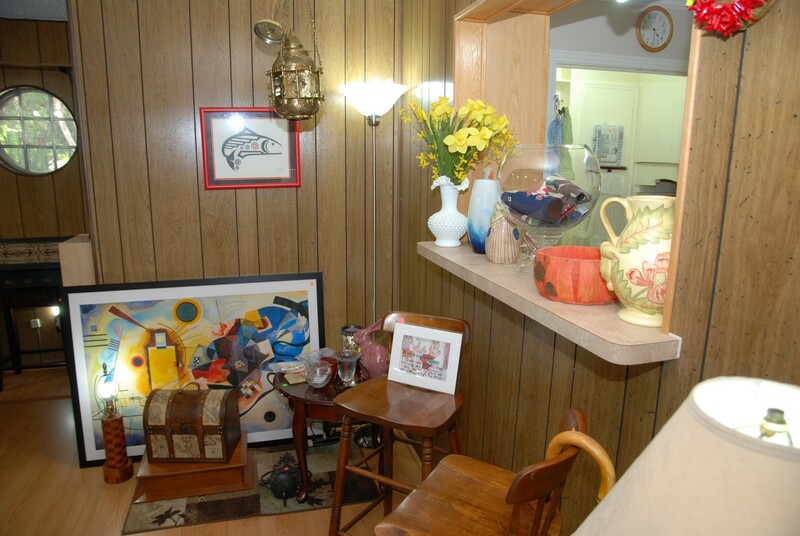 We have a brass lamp, a red framed fish picture, and a small domed storage box. 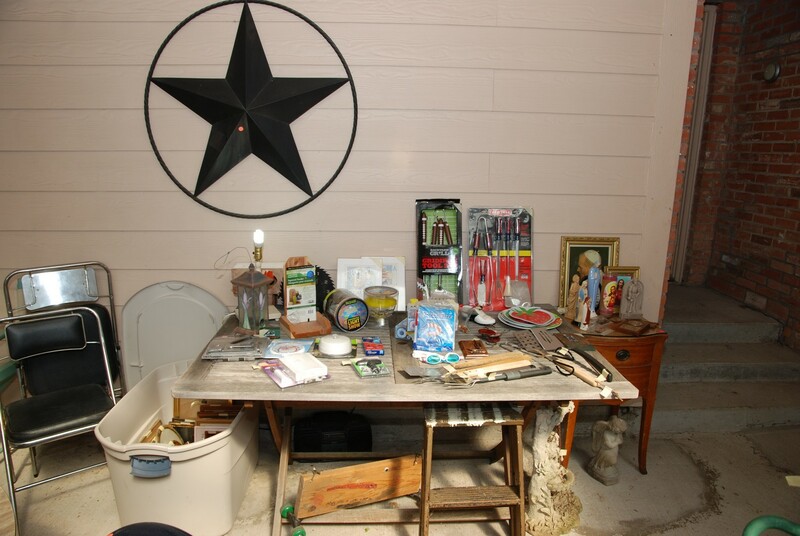 We have a dark wood computer drawer table with more interesting items / knick-knacks. There are two matching chairs with rattan seats. 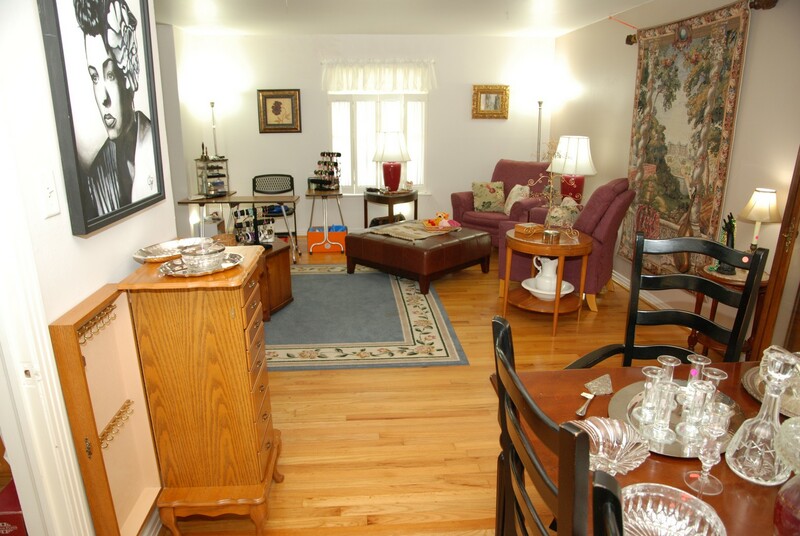 There is a small vintage caned seat chair and a plaid wingback love seat. 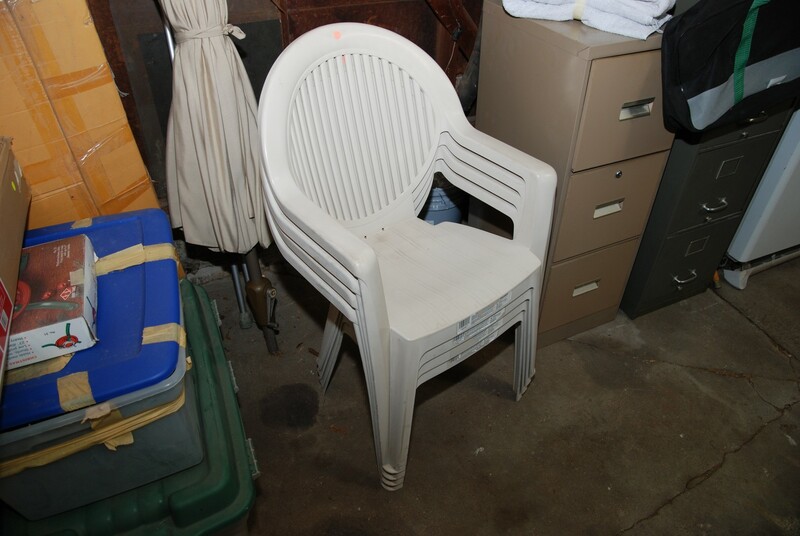 We have four wooden folding chairs in like new condition. 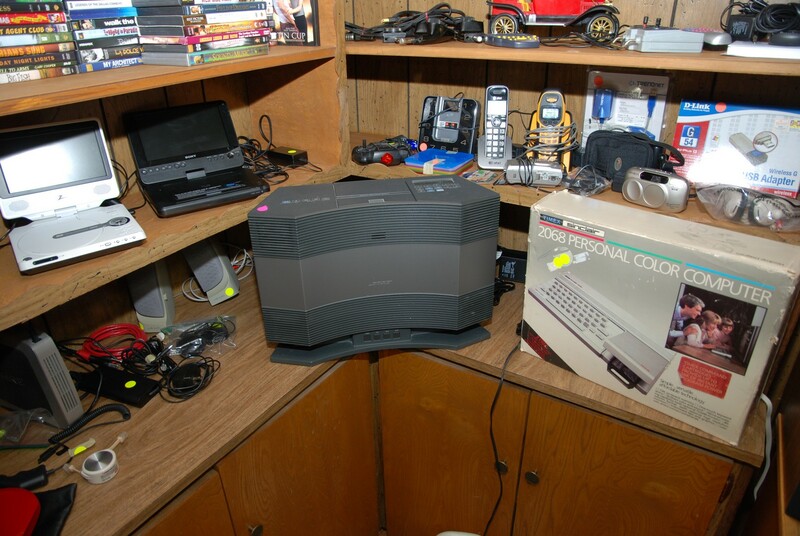 The electronics area has a 2068 Personal Color Computer still in box. A powered motor boat, a powered model car and assorted phones. We have lots of DVD’s - some are new. We have three different portable DVD players; one is a SONY hi-res LCD Display with widescreen. 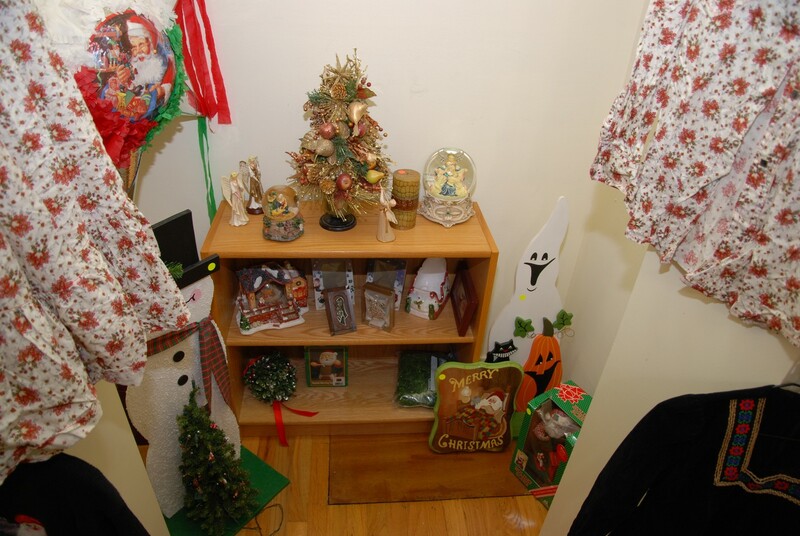 It plays DVD’s, CD’s, MP3’s, and digital photos. 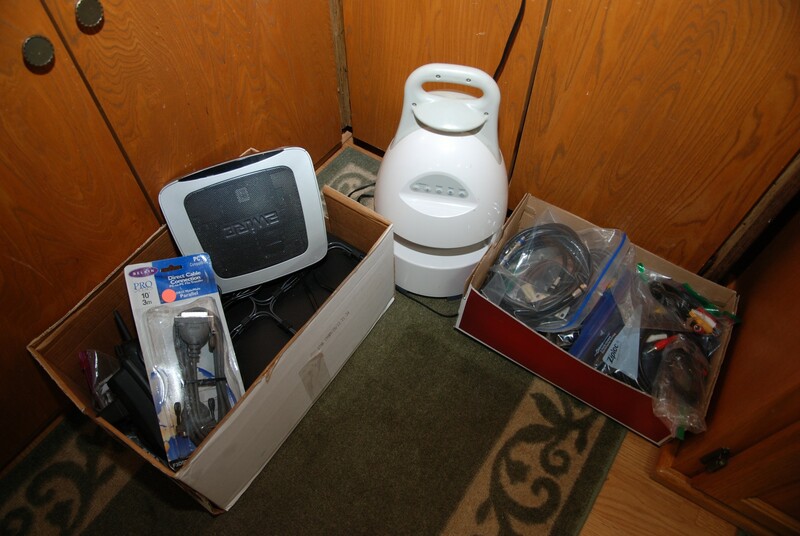 Then we have a “:Z” DVD, CD, R-RW, and we have an Accurian DVD player, with integrated rechargeable battery. It also plays MP3’s. 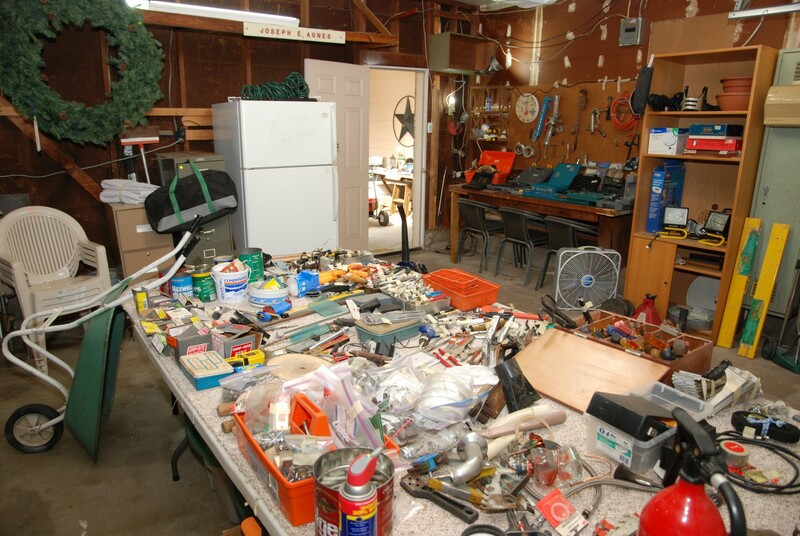 There are radios, cameras, speakers and electronic cords and adaptors. 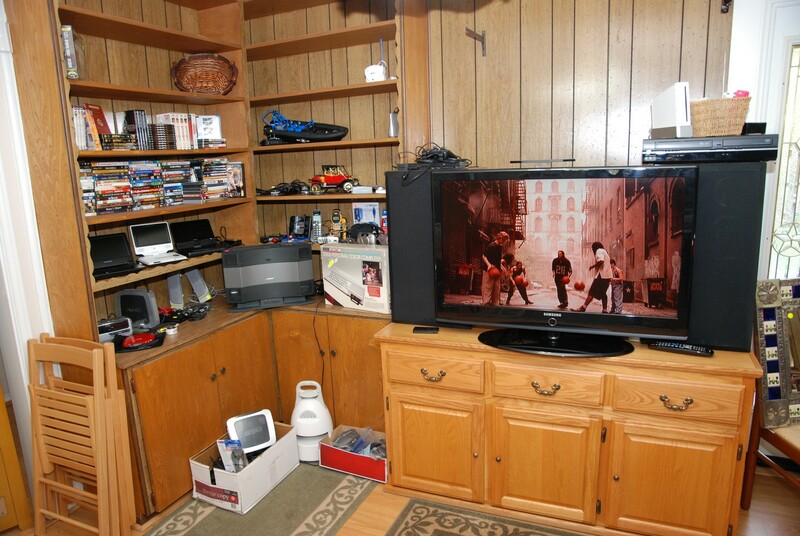 There is a BOSE Acoustic Wave Music System, an Optimus Clock Radio, a Sony CD Player, a Toshiba VHS Hi-Fi with a DVD Digital Cinema Progress Player and a Wii with three controls and some games. 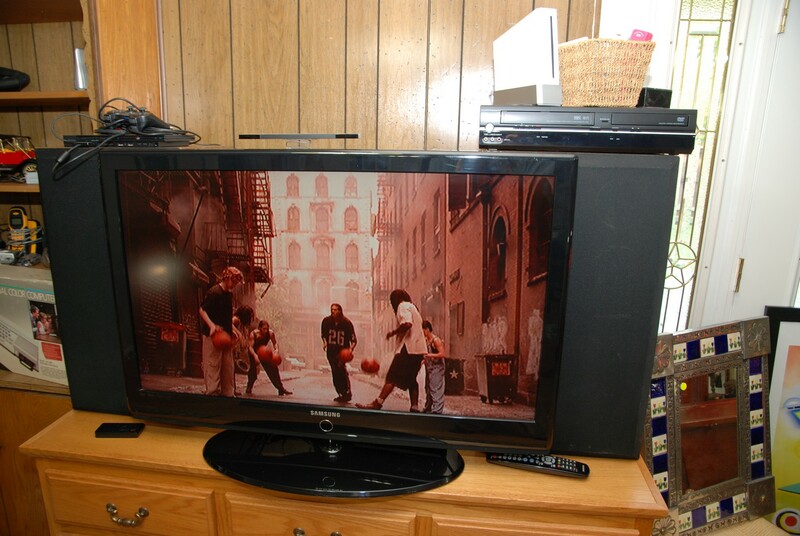 There is a Samsung Flat Screen TV with Remote on a stand. 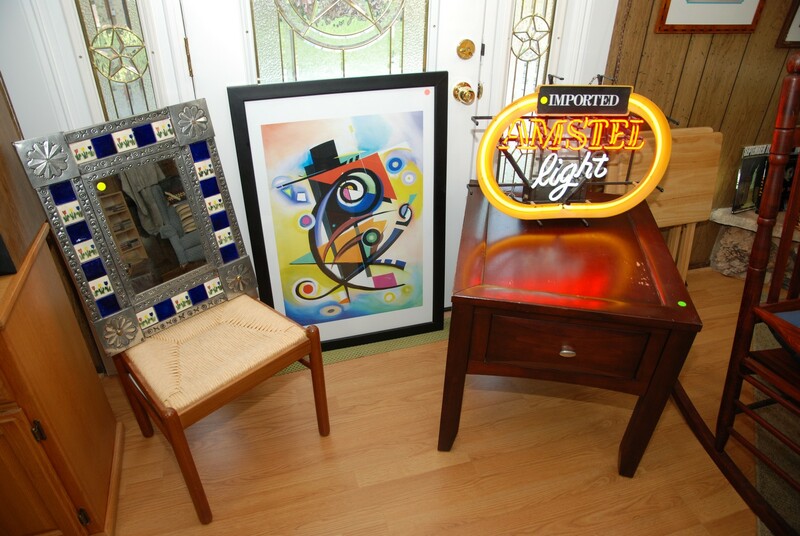 There is a great Imported AMSTEL light Neon Beer Sign (works great), and a nice side / end table with drawer. 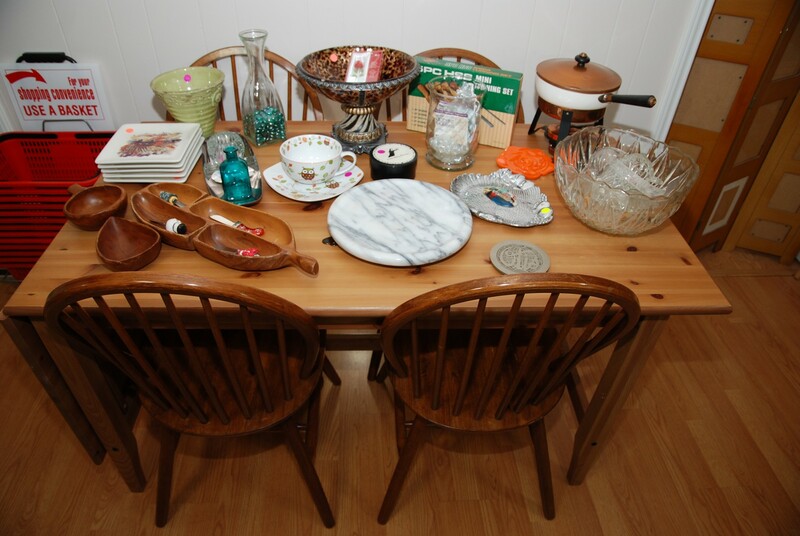 How about an all wood king chair or a vintage Double Tray Table. We have some awesome records in great condition like: Stix, Elton John, Led Zeppelin, David Gilmore, Traffic, Pink Floyd, Neil Young, Fleetwood Mac, Dex Leppard, Journey, Blind Faith, Van Halen, Ton Detty, Robert Gray, and more. Come early for the best selection. 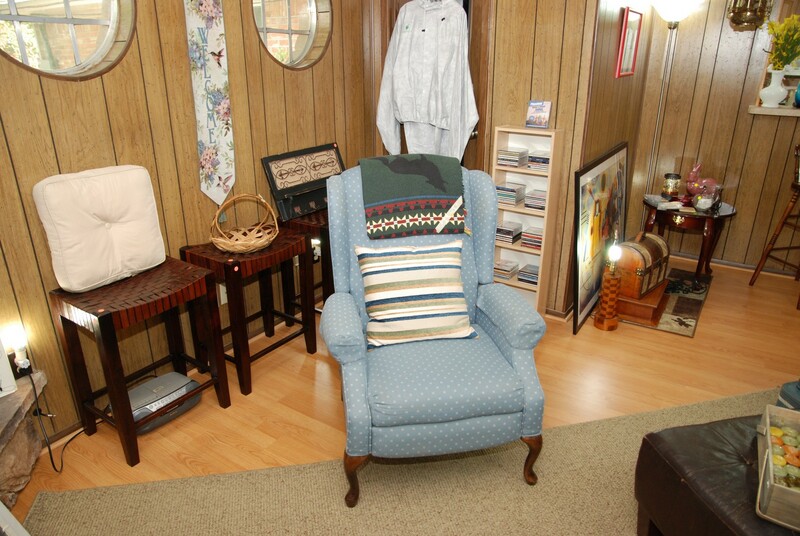 We have three woven-seat bar stools and a blue push back recliner. 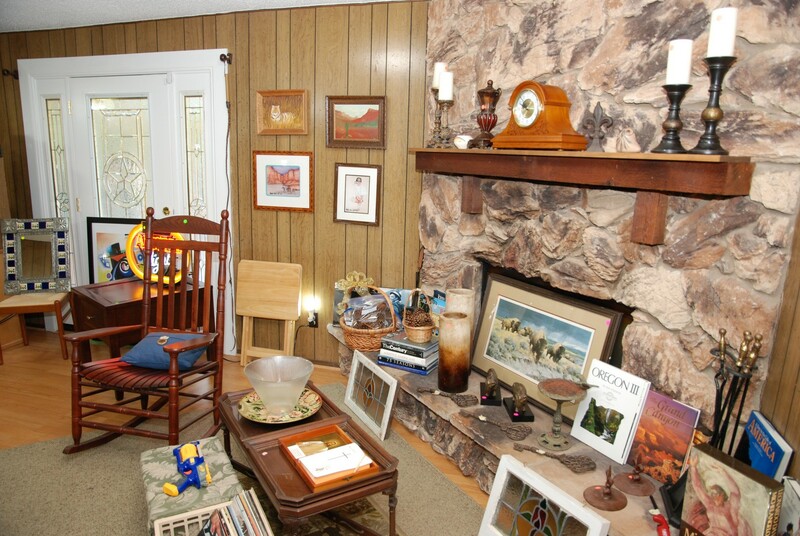 There is a nice framed buffalo picture along with some bronze buffalo book ends. 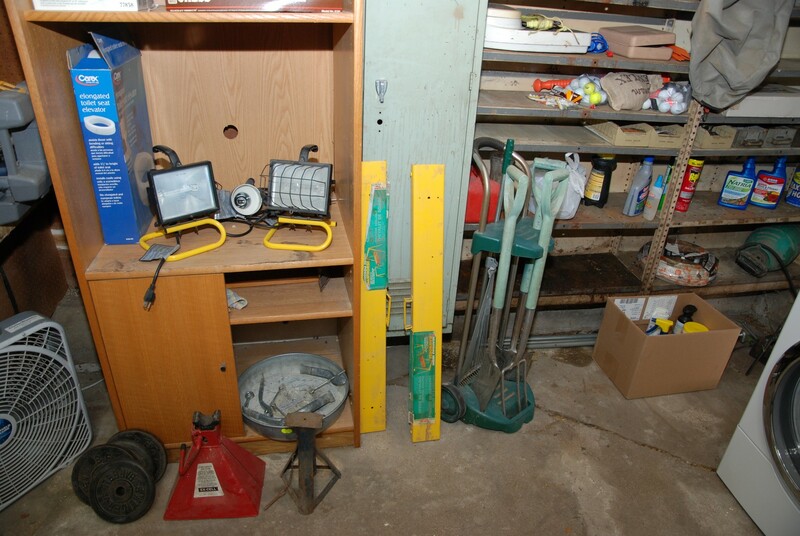 We have two tall cylinders and some metal items. There is a nice fireplace tool set. 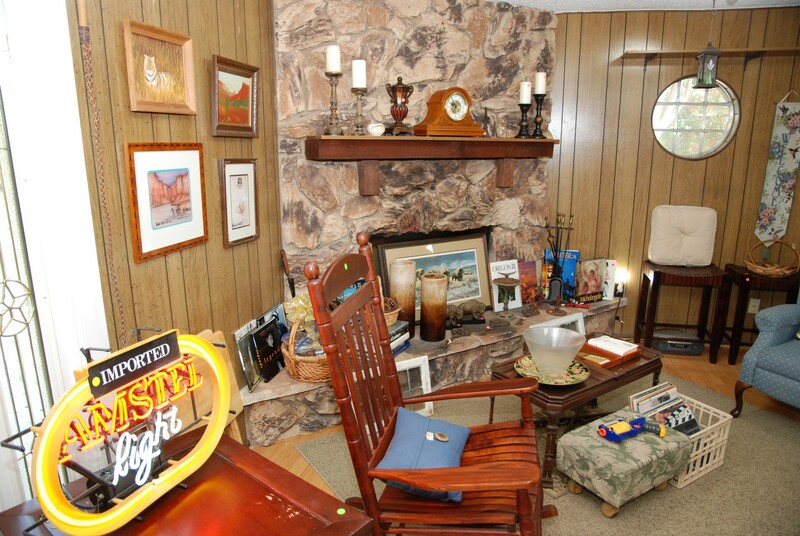 We have some nice coffee table books, candle sets, and a mantel clock. There is another nice medium size area rug. We have lots of CD’s and some interesting framed pictures along with a light windbreaker pants and jacket set. Check out the hanging door mirror and large leather like ottoman. 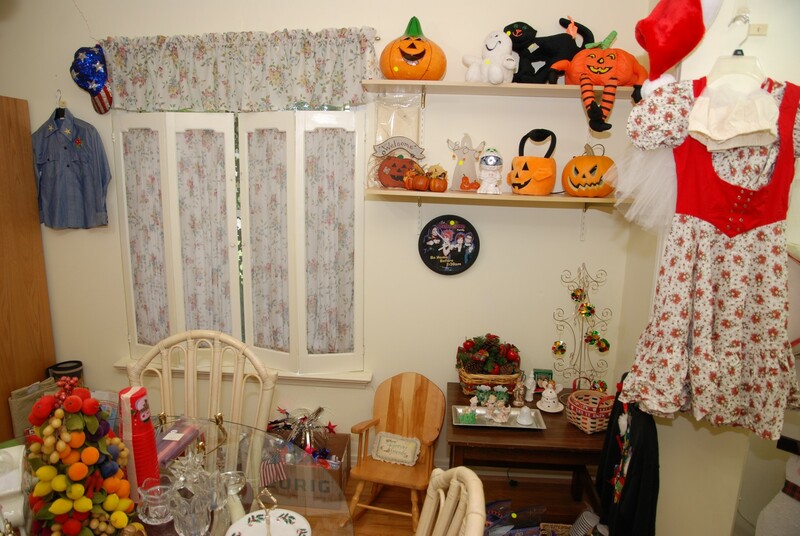 We have vintage two stained-glass windows, a vintage doll (needs repair) and a nice square side table with bottom shelf. Come early for best selections. 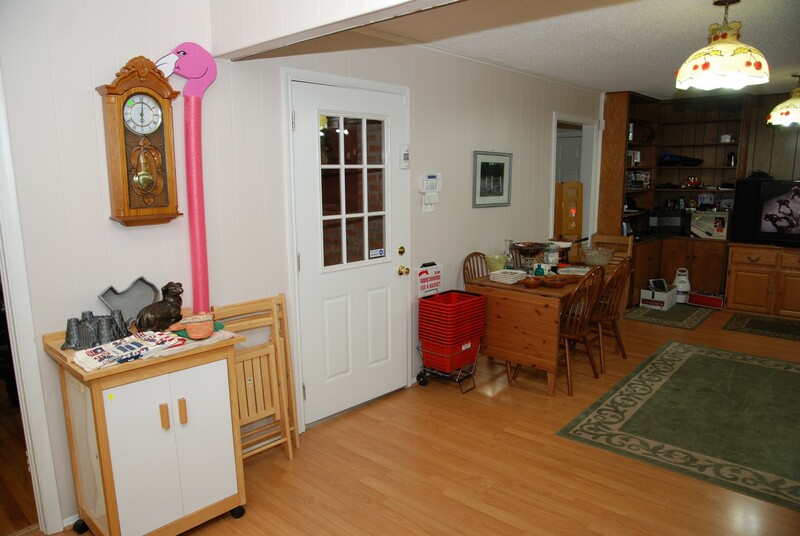 Sun Room – features lots of yard and patio items along with exercise equipment. 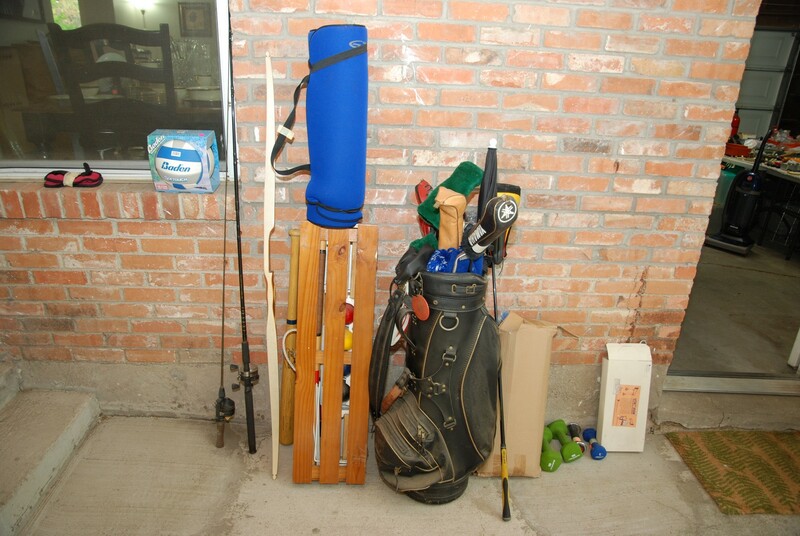 We have a set of Golf Clubs with bag. A vintage two drawer side table with glass top. 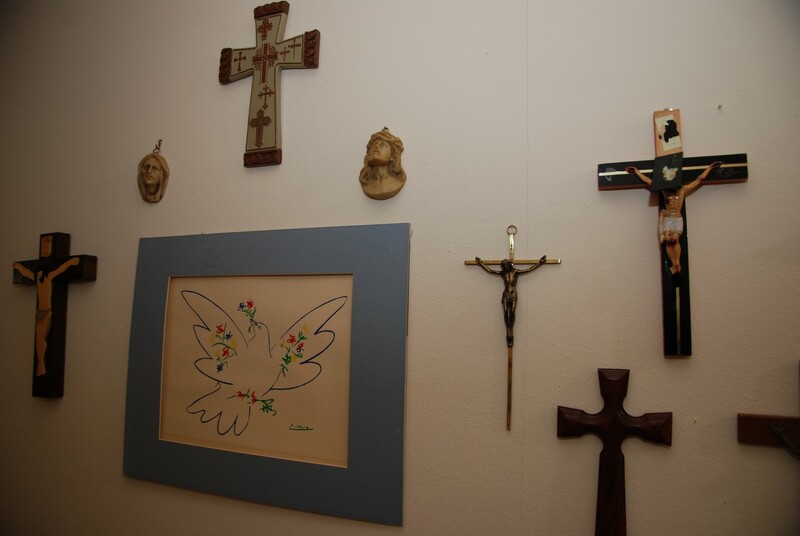 This table features some religious items (mostly Catholic) including rosaries. 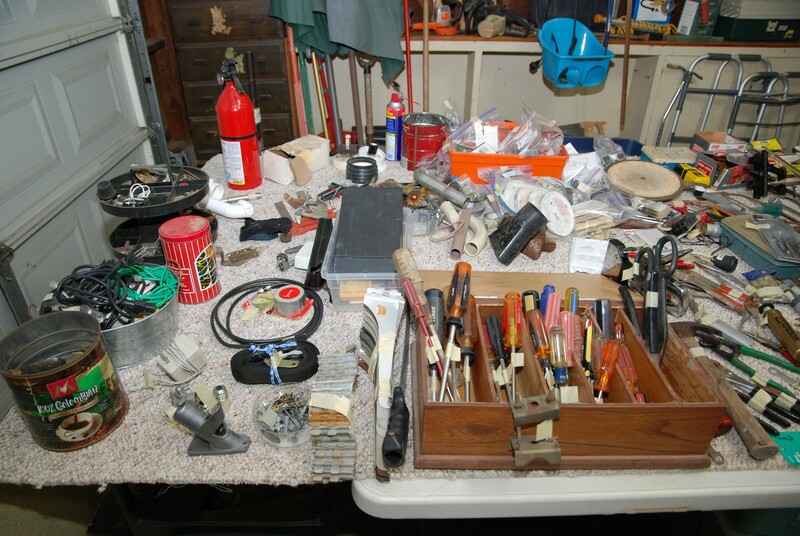 There is a nice wooden patio table holding lots of interesting grilling items and tools (some are new). 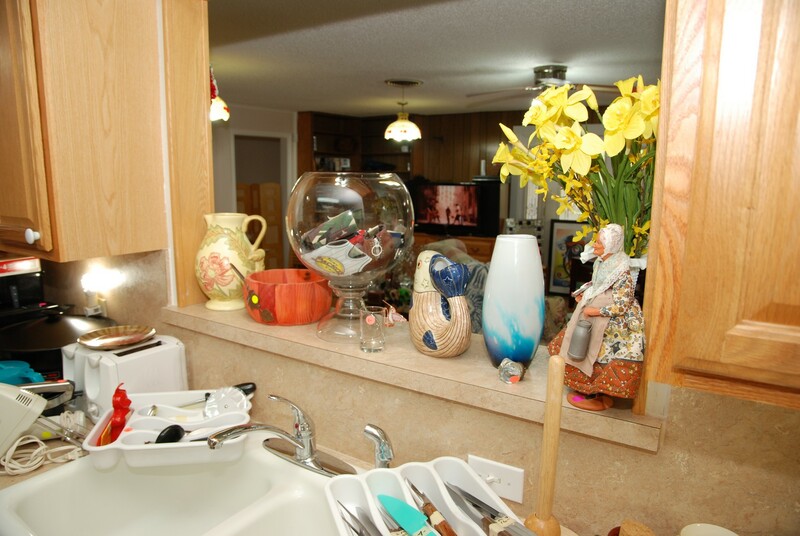 We have a four-drawer cabinet with a large ceramic simulated tree. 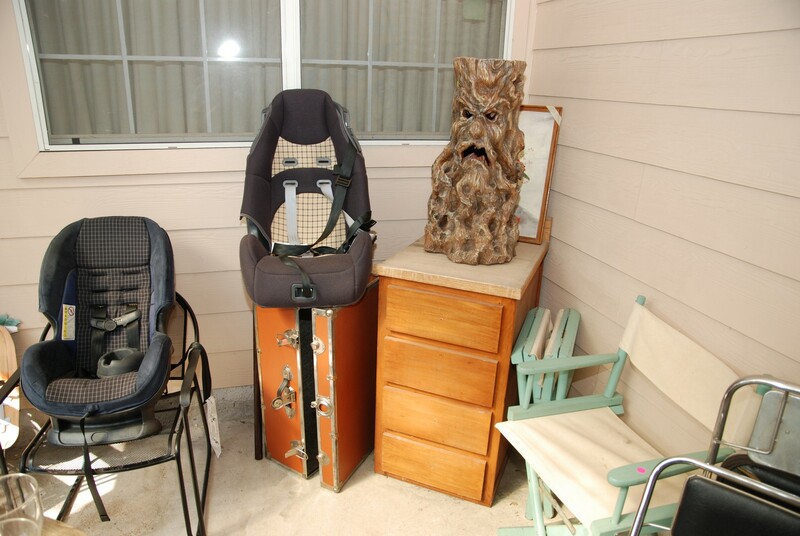 There are two child car seats and a trunk. 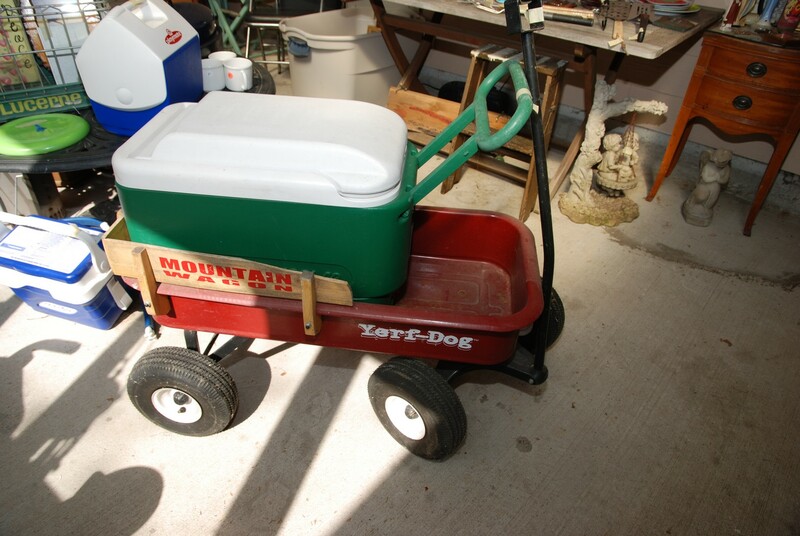 We have a fun large mountain (steel and wood) wagon (Yerf-Dog) that has large wheels (all terrain) and a nice pull handle. 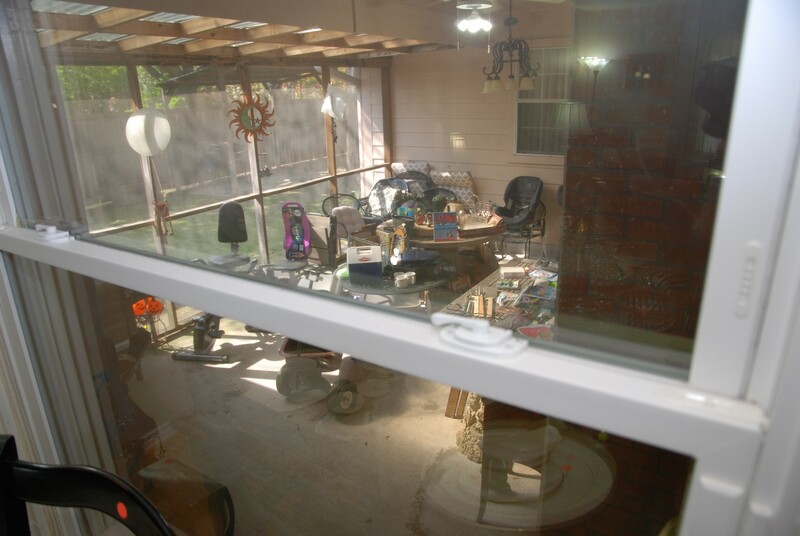 We have quite a bit of stuff in this sun room, so please make sure to look under the larger items so you don’t miss anything. 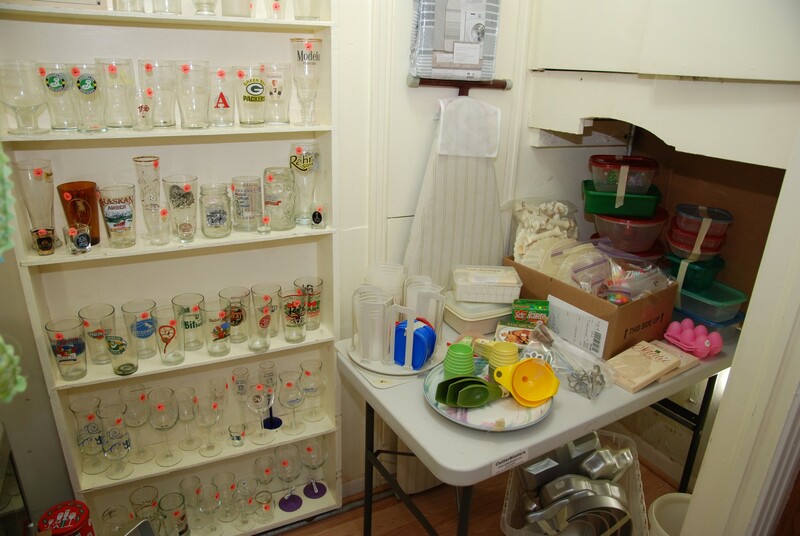 We have assorted coolers, mugs, cups and glasses for outdoors. 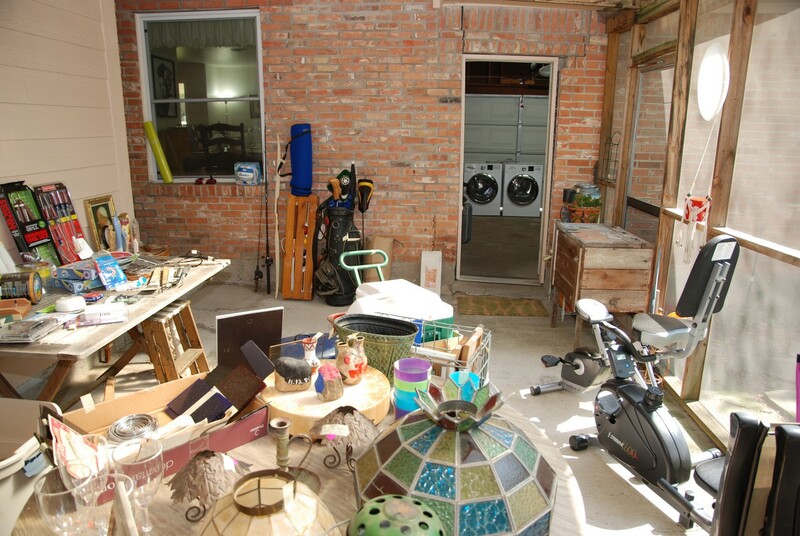 There are all sorts of containers and bins along with patio furniture. 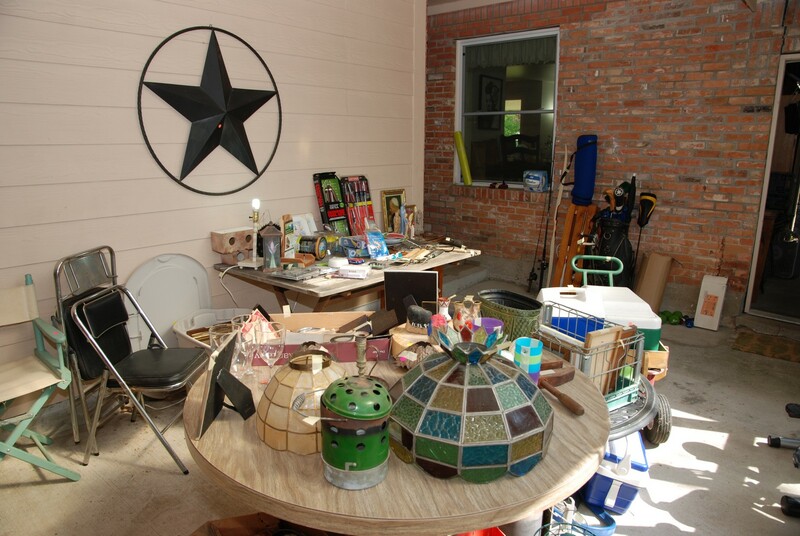 There is a round metal coffee table, small outdoor shelves, and some pots. 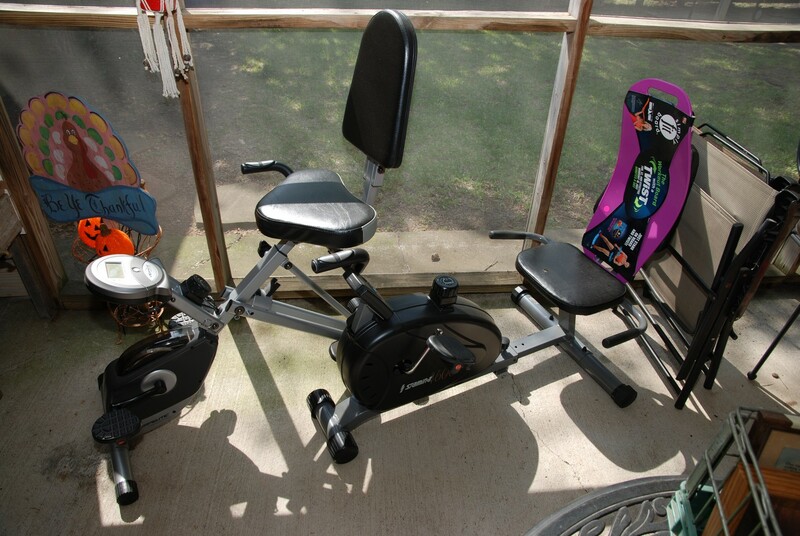 We have some hand-held weights, an Exerpelite Therapeutic Fitness Machine, and a low-profile exercise bike. 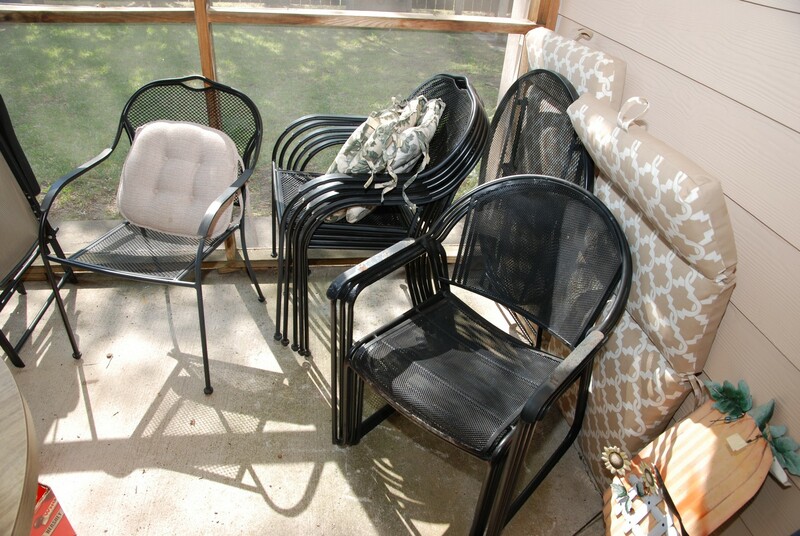 We have 12 rounded-back metal arm chairs that have mesh backs and seats. They’re very nice, and they’re stackable –awesome! 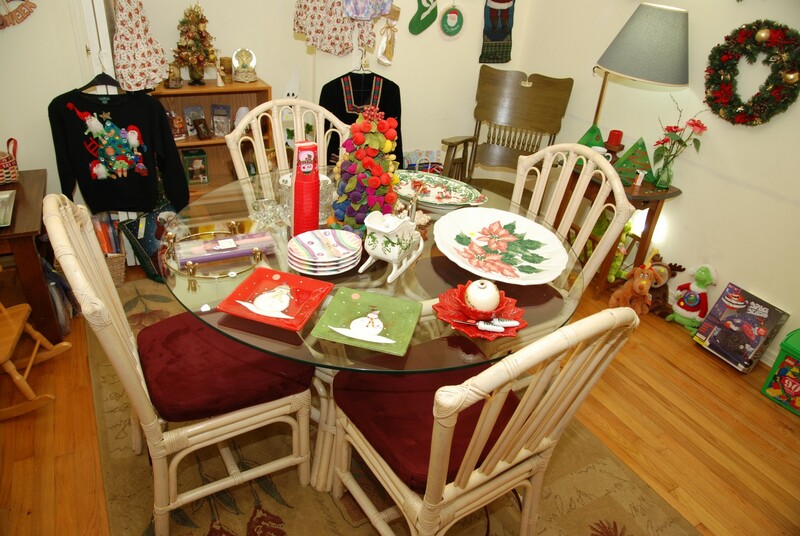 There are chair cushions, a modern light fixture, dozens of picture frames, and another round table with large base. 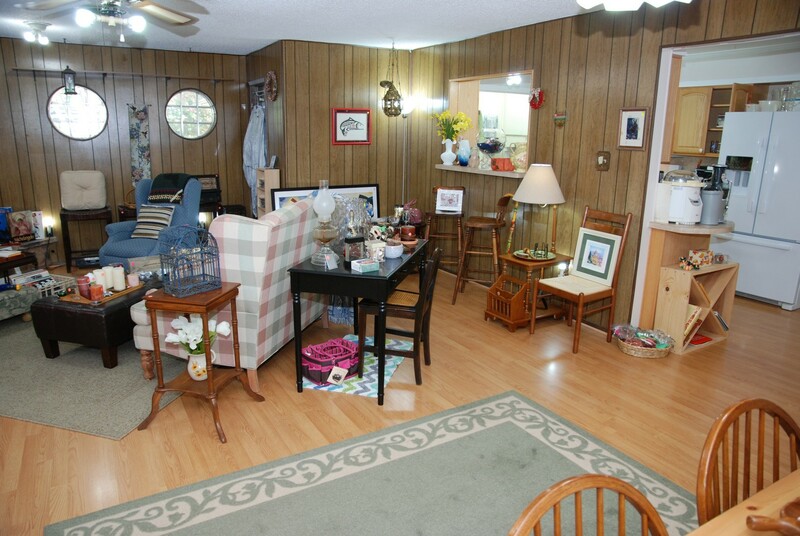 We also have some folding chairs and wind chimes. 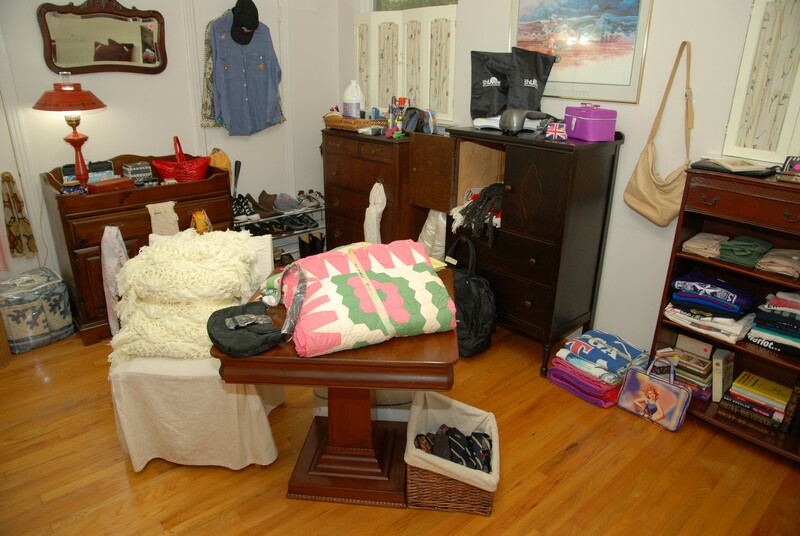 Come early for the stuff in this room as spring has arrived, and these items will not last long. 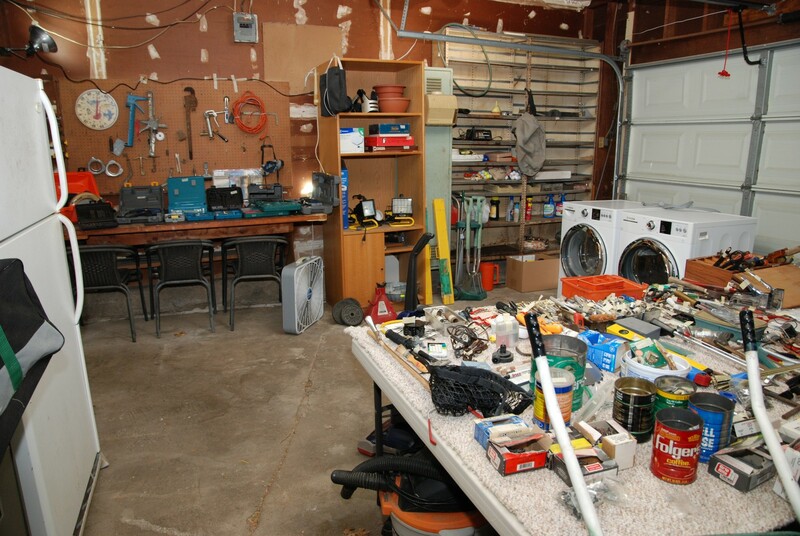 Large Double Garage – features assorted hand tools and lots of DIY home fix-it items. 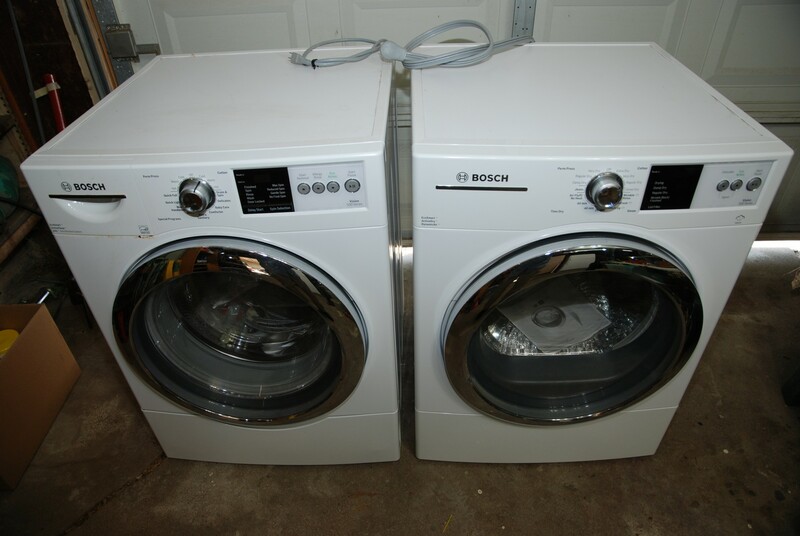 We have a great Washer and Dryer in white by BOSCH (both are front loading). Come early if you’re interested in this nice pair. 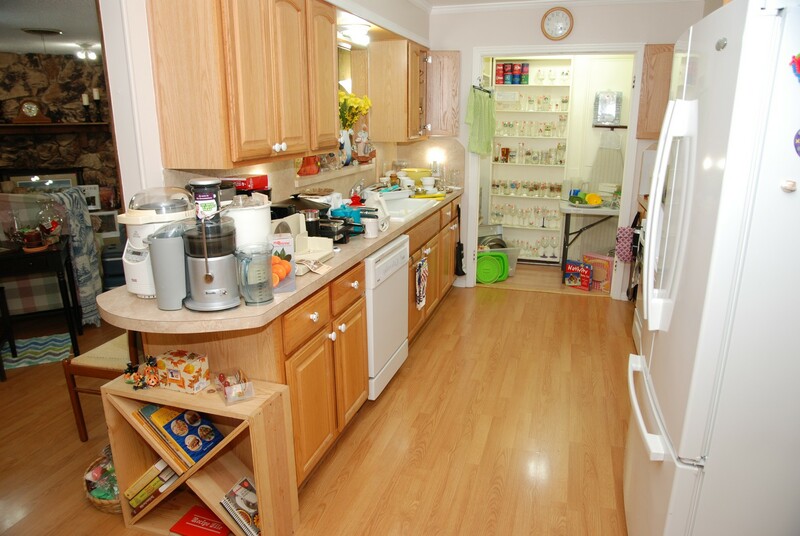 We also have a Whirlpool white fridge / freezer just in time for those cold drinks in the garage. 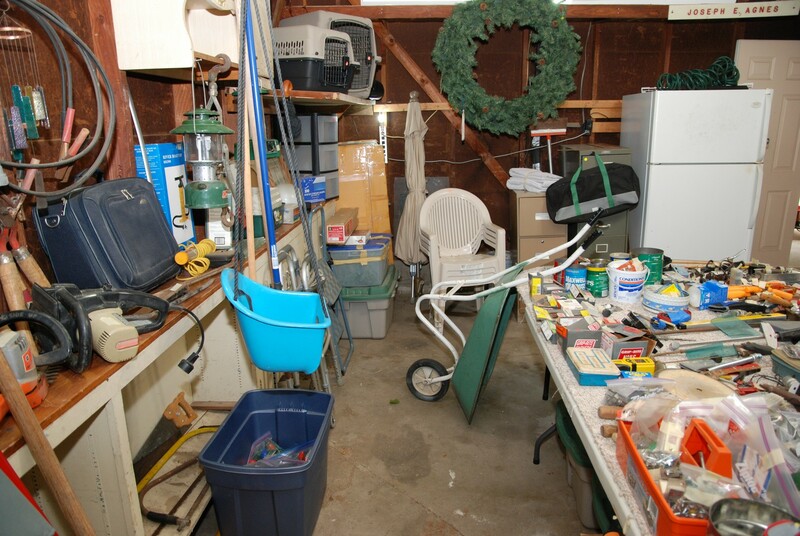 This garage has so much to look at it will take a little while to see it all. 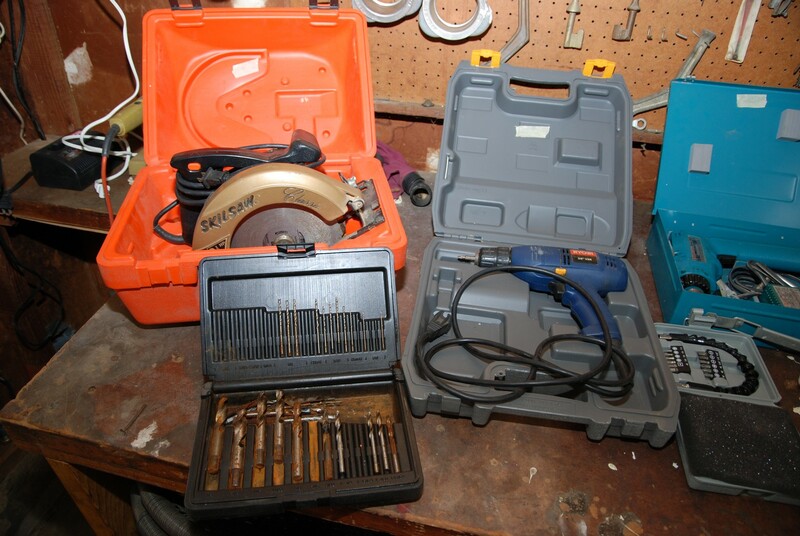 We have all sorts of tool sets, a large pipe wrench, extension cords, electrical power tools. 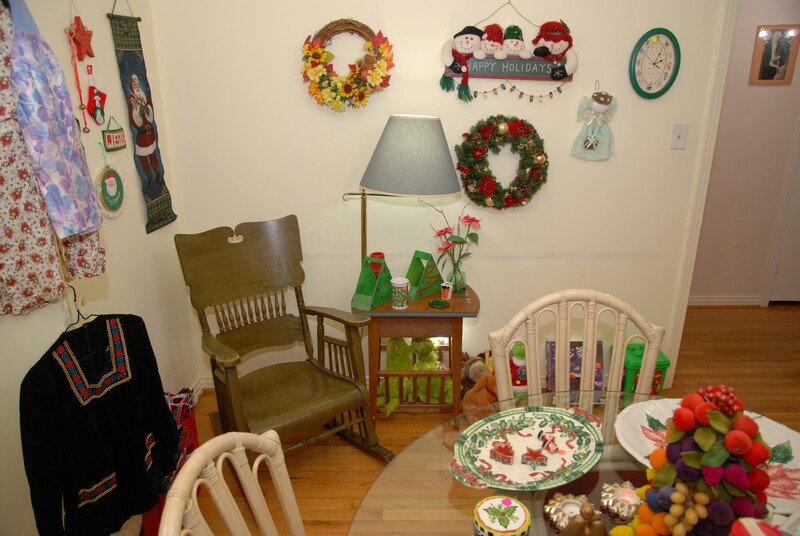 There are painting masks, a temperature gauge, patio chairs, a Skill Saw, large Christmas tree and a large wreath. 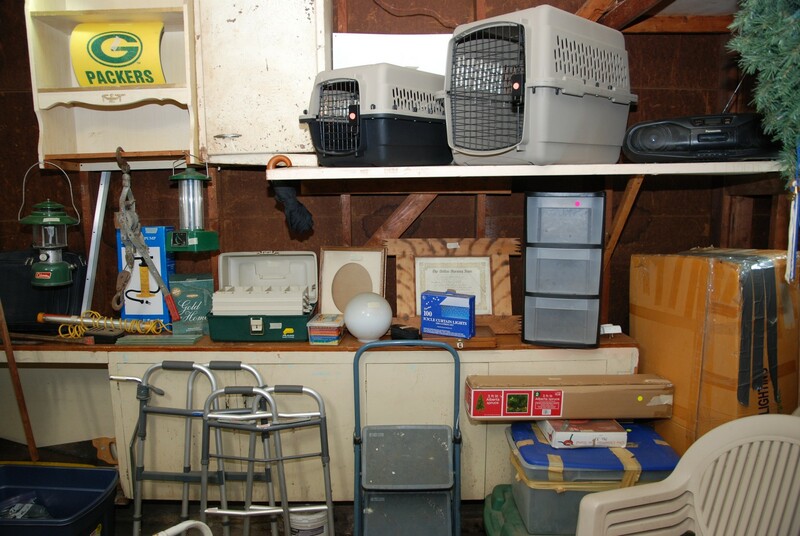 We have pet containers, folding step stools stacking patio chairs, walkers, and hand held garden tools. There is a nice patio umbrella and metal stand. We have totes, stools, and Hoover Vacuum cleaner. 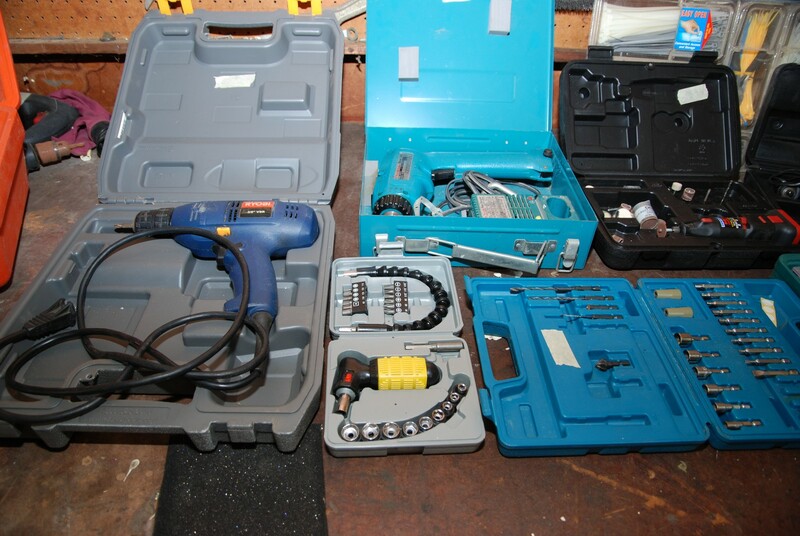 We have metal file cabinets and much more. 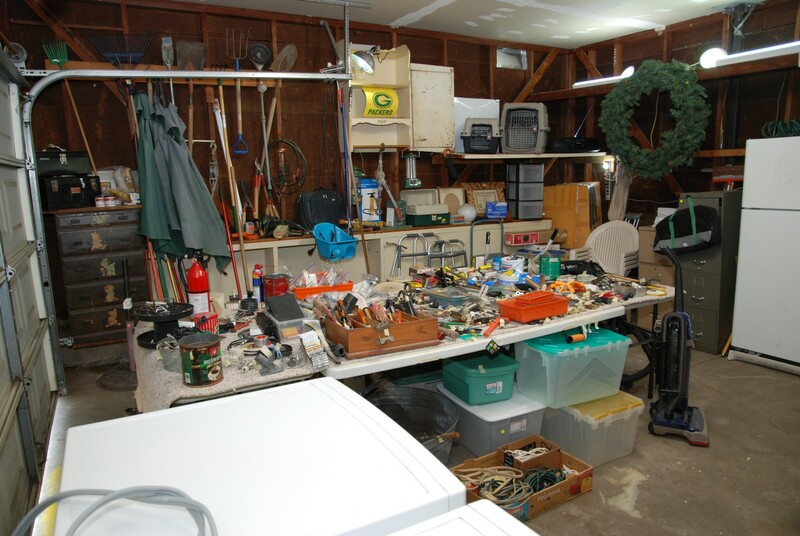 You will notice that we have lots of great treasures squirreled away in this garage. So; come early for the best finds before they are gone.